Ceramides are central intermediates of sphingolipid metabolism that also function as potent messengers in stress signaling and apoptosis. Progress in understanding how ceramides execute their biological roles is hampered by a lack of methods to manipulate their cellular levels and metabolic fate with appropriate spatiotemporal precision. Here, we report on clickable, azobenzene-containing ceramides, caCers, as photoswitchable metabolic substrates to exert optical control over sphingolipid production in cells. Combining atomic force microscopy on model bilayers with metabolic tracing studies in cells, we demonstrate that light-induced alterations in the lateral packing of caCers lead to marked differences in their metabolic conversion by sphingomyelin synthase and glucosylceramide synthase. These changes in metabolic rates are instant and reversible over several cycles of photoswitching. Our findings disclose new opportunities to probe the causal roles of ceramides and their metabolic derivatives in a wide array of sphingolipid-dependent cellular processes with the spatiotemporal precision of light. Sphingolipids are unusually versatile membrane components in eukaryotic cells that contribute to mechanical stability, cell signaling and molecular sorting (Holthuis et al., 2001). They derive from the addition of various polar head groups to ceramide, a hydrophobic molecule containing saturated or trans-unsaturated acyl chains linked to a serine backbone (Wegner et al., 2016). The enzymes responsible for sphingolipid production and turnover comprise a complex metabolic network that gives rise to numerous bioactive molecules. Intermediates of sphingolipid metabolism, notably sphingosine, ceramide and their phosphorylated derivatives, influence a multitude of physiological processes, including cell proliferation, cell death, migration, stress adaptation, immune responses and angiogenesis (Hannun and Obeid, 2018). Consequently, imbalances in sphingolipid metabolism are linked to major human diseases (Ogretmen, 2018). Sphingomyelin (SM) and glycosphingolipids (GSLs) are the main sphingolipid classes in mammals (Koval and Pagano, 1991; D'Angelo et al., 2013). SM forms a concentration gradient along the secretory pathway and influences cellular cholesterol homeostasis to sustain vital physical properties of the plasma membrane, where SM and Chol are enriched (Slotte, 2013). The hydrolysis of plasma membrane SM by sphingomyelinases generates ceramide, which mediates several stress responses including cell cycle arrest, senescence and apoptosis (Adada et al., 2016). SM biosynthesis is mediated by SM synthase (SMS), an enzyme catalyzing the transfer of phosphocholine from phosphatidylcholine (PC) onto ceramide, yielding SM and diacylglycerol (DAG). Mammals contain two SMS isoforms, namely SMS1, responsible for bulk production of SM in the Golgi lumen, and SMS2, serving a role in regenerating SM from ceramides released by sphingomyelinases on the cell surface (Huitema et al., 2004; Yamaoka et al., 2004). Besides their biological potential as cross-regulators of the pro-apoptotic factor ceramide and mitogenic factor DAG, studies in mice revealed roles for SMS1 and SMS2 in inflammation, atherosclerosis and diabetes (Mitsutake et al., 2011; Li et al., 2011; Liu et al., 2009). Conversely, GSLs are synthesized by the sequential action of Golgi-resident glycosyltransferases. These enzymes conjugate ceramide to a specific carbohydrate from a sugar nucleotide (e.g. UDP-glucose, UDP-galactose), or onto a ceramide-conjugated carbohydrate chain, giving rise to a large variety of structurally and functionally divergent compounds (D'Angelo et al., 2013). While GSLs are dispensable for cell survival, they are key to cell-cell communication and collectively required for mammalian development (D'Angelo et al., 2013; Yamashita, 2000). Progress in understanding how sphingolipids exert their multitude of tasks is hindered by a lack of suitable methods to probe lipid function (Honigmann and Nadler, 2018). Manipulation of cellular lipid pools by altering expression of metabolic enzymes is a slow process, allowing cells to mount an adaptive response that dampens functional impact. The fact that lipid metabolic networks are highly interconnected also makes it difficult to prove that the direct product of a specific enzyme is the actual effector. Chemical dimerizers and optogenetic approaches allow researchers to manipulate lipid levels more rapidly, but their application often requires extensive protein engineering and is largely restricted to soluble lipid-metabolic enzymes or transfer proteins (Jain et al., 2017). Another method to rapidly increase lipid supply involves the use of caged lipids. These compounds carry a photo-labile protecting group that blocks their biological activity until the active lipid is released with a flash of light (Kim et al., 2016; Höglinger et al., 2014; Höglinger et al., 2015). Alongside the recent development of site-directed variants of caged sphingosine, it has become possible to confine release of this bioactive lipid to specific organelles (Feng et al., 2018). However, once triggered, the activity cannot be switched off and the decay of the lipid signal depends on its metabolic conversion. In this respect, photoswitchable azobenzene-containing lipids hold great promise by allowing the translation of optical stimuli into a reversible cellular response (Frank et al., 2015; Frank et al., 2016a; Frank et al., 2016b). In previous studies, we demonstrated the potency of azobenzene-containing fatty acids as photoswitchable agonists of the vanilloid receptor 1 (Frank et al., 2015), and found that photoswitchable DAGs enable light-mediated oscillations in protein kinase C activation (Frank et al., 2016a). We recently synthesized a set of azobenzene-containing ceramides (ACes) to exert optical control over the curvature of the N-acyl chain. All three ACes displayed a light-dependent cycling between liquid-ordered (Lo) and liquid-disordered (Ld) domains when incorporated into phase-separated supported lipid bilayers (SLBs), thus enabling dynamic manipulation of membrane structure and fluidity (Frank et al., 2016b). Whether such light-mediated restructuring of membranes can also be implemented in living systems remained unclear. Moreover, whether azo-ceramides can be exploited to reversibly manipulate sphingolipid metabolism or function remained to be established. Here, we introduce a new generation of photoswitchable ceramides containing an azobenzene in the sphingoid base or N-acyl chain, along with a clickable alkyne group for increased metabolite detection sensitivity. Using both synthetic bilayers and living cells as experimental models, we demonstrate the potential of these compounds as photoswitchable substrates to place sphingolipid biosynthesis under the dynamic control of light. We designed and synthesized four clickable and azobenzene-containing ceramide analogues, caCer-1–4 (Figure 1a,b, Supplementary file 1). Each caCer has an N-acyl chain possessing a terminal alkyne for click-derivatization with a fluorophore reporter. caCer-1 is a clickable variant of ACe-1 on which we reported earlier (Frank et al., 2016b) (Figure 1c), and carries the azobenzene photoswitch in its N-acyl chain with the diazene group mimicking a Δ9-double bond. caCer-2 has a shorter N-acyl chain with an azobenzene whose diazene group mimics a Δ6-double bond. These two analogues were synthesized by first converting the commercially available aldehyde 1 to terminal alkyne 2 with the Ohira-Bestmann reagent (Ohira, 1989; Müller et al., 1996). A tin dichloride-mediated reduction then afforded aniline 3, which was subjected to the Baeyer-Mills reaction (Baeyer, 1874; Mills, 1895). Using different nitroso compounds, the functionalized fatty acids cFAAzo-4 (Figure 1—figure supplement 1) and cFAAzo-1 (Figure 1—figure supplement 2) could be prepared. Amidation of cFAAzo-4 and cFAAzo-1 with d-erythro-sphingosine afforded caCer-1 and caCer-2, respectively. UV-Vis spectroscopy revealed that both compounds behaved as standard azobenzenes (Figure 1—figure supplement 3a,b). In the dark, they existed in their thermally stable trans-configuration, and could be isomerized to cis using UV-A (350–390 nm) illumination. The trans-isomer could be regenerated using blue (470 nm) light (Figure 1d). Design and synthesis of clickable and photoswitchable ceramides. (a) Chemical structure of C16:0-Cer, with color-coded sphingoid base (black) and N-acyl chain (red). (b) Chemical structures of clickable and photoswitchable ceramides caCer-1–4. (c) Chemical structures of clickable ceramide cCer and photoswitchable ceramide ACe-1. (d) caCer-1 undergoes reversible isomerization between its cis- and trans-configuration with UV-A (365 nm) and blue (470 nm) light, respectively. (e) Chemical synthesis of the photoswitchable sphingoid base aSph-1, which was N-acylated with a terminal alkyne-functionalized C15 fatty acid to afford caCer-3. (f) UV-Vis spectra of the red-shifted variant caCer-3 (50 μM in DMSO) in its dark-adapted (trans, black), UV-A-irradiated (cis, violet) and blue-irradiated (trans, blue) states. (g) caCer-3 (50 μM in DMSO) undergoes isomerization to its cis-configuration with UV-A light (350–390 nm), and this effect is completely reversed with blue light (465 nm). Photoswitching was monitored by measuring the absorbance at 365 nm. caCer-3 and caCer-4 were designed around two distinct azobenzene-containing sphingoid bases, aSph-1 and aSph-2, which possessed either a two- or four-carbon linker between the head group and the azobenzene, respectively (Figure 1e, Figure 1—figure supplement 4). The styrene aSph-1 was synthesized from 4-propylaniline, which was converted by Baeyer-Mills reaction to the hydroxymethyl azobenzene 5 (Figure 1e). Sequential oxidation to aldehyde 6 and Wittig reaction afforded olefin 7. Cross-metathesis (Rai and Basu, 2004; Peters et al., 2007) of 7 with the l-serine-derived allyl alcohol 8 (Garner, 1984; Garner and Park, 1992) followed by deprotection afforded aSph-1. Acylation with the C15 terminal alkyne-tagged fatty acid 4 (Seike et al., 2006) (Figure 1—figure supplement 4a) afforded caCer-3 (Figure 1e). caCer-4 was prepared in an analogous fashion from aSph-2 (Figure 1—figure supplement 4b). UV-Vis spectroscopy revealed that the styrene caCer-3 possessed a slightly red-shifted absorption spectrum, with a λmax at 365 nm (Figure 1f) compared to about 335 nm for the rest of the caCers (Figure 1—figure supplement 3). To determine the optimal photoswitching wavelength to generate cis-caCer-3, we continuously monitored the absorbance at 365 nm in solution and performed a wavelength scan between 350 to 410 nm. We found that the trans to cis isomerization of caCer-3 was most efficient at 370 nm, similar to the rest of the caCers and ACes (Frank et al., 2016b) (Figure 1g). caCer-4 possessed similar absorption spectra as caCer-1 and caCer-2 (Figure 1—figure supplement 3c). We previously reported that N-acyl-azobenzene ceramides analogous to caCer-1 and caCer-2, but lacking the alkyne functionality, can be used to optically manipulate the structure of phase-separated lipid domains in SLBs (Frank et al., 2016b). However, whether ceramides with azobenzene-containing sphingoid bases display a similar behavior in such lipid environments was still in question. We therefore performed confocal fluorescence imaging and scanning atomic force microscopy (AFM) on SLBs containing a quaternary lipid mixture of 1,2-O-dioleoyl-sn-glycero-3-O-phosphocholine (DOPC), cholesterol, SM (C18:0) and caCer-3 or caCer-4 at a molar ratio of 10:6.7:5:5 DOPC:cholesterol:SM:caCer (Figure 2). Each lipid mixture was doped with 0.1 mol% ATTO-655-DOPE to allow visualization of domain segregation in the SLB using confocal microscopy through the preferential localization of the dye in liquid-disordered (Ld) membrane regions (Frank et al., 2016b). Confocal fluorescence imaging of SLBs from lipid mixtures containing the dark-adapted trans-caCers revealed a clear phase separation, with liquid-ordered (Lo) domains appearing as dark regions (Figure 2a). Photo-isomerization of caCers affects membrane fluidity and lipid domain structure in supported lipid bilayers. (a) Confocal fluorescence microscopy of SLBs containing a quaternary mixture of DOPC:cholesterol:SM:caCer (10:6.7:5:5 mol ratio) and 0.1 mol% ATTO655-DOPE. 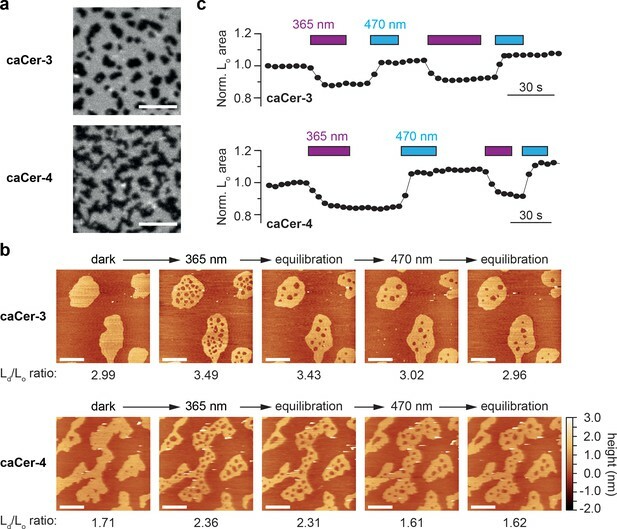 Images of SLBs prepared with dark-adapted trans-caCer-3 and trans-caCer-4 revealed phase separation, with taller liquid-ordered (Lo) domains appearing as dark regions in a liquid-disordered (Ld) phase. Scale bars, 10 μm. (b) Atomic force microscopy of SLBs prepared as in (a). Isomerization of caCer-3 (top) and caCer-4 (bottom) to cis with UV-A light (365 nm) resulted in a fluidification inside the Lo domains, as indicated by the appearance of small fluid Ld lakes and an increased Ld/Lo area ratio. This effect was reversed on isomerization back to trans with blue light (470 nm), marked by a drop in the Ld/Lo area ratio. Scale bars, 2 μm. (c) Time-course plotting the normalized Lo area over multiple 365/470 nm irradiation cycles for caCer-3 (top) and caCer-4 (bottom). Imaging of the SLBs by AFM confirmed the formation of Lo domains, which rested approximately 1 nm above the Ld phase (Figure 2b). UV-A-induced isomerization of dark-adapted caCers to cis led to a rapid fluidification of the Lo domains, as indicated by the appearance of many small liquid-disordered (Ld) ‘lakes’ within the Lo domains, alongside an increase in the Ld/Lo area ratio. During equilibration, these lakes laterally diffused toward the Ld phase or coalesced into larger lakes in an effort to minimize line tension. On isomerization of caCers to trans by blue light, the Ld lakes shrunk in size while the surrounding Lo areas expanded, essentially occupying the same total area as in the original dark-adapted state. These light-induced effects on lipid domains were observed for both caCer-3 (Figure 2b, top) and caCer-4 (Figure 2b, bottom) and could be repeated over multiple cycles of UV-A and blue light illumination (Figure 2c, Figure 2—video 1 and 2). This indicates that, while trans-isomers of caCer-3 and caCer-4 preferentially localize to cholesterol- and SM-rich Lo domains, their cis-isomers favor association with more loosely packed lipids like DOPC. Hence, ceramides carrying the azobenzene in their sphingoid backbone display similar light-dependent preferences for Lo and Ld domains as those reported for N-acyl-azobenzene ceramides (Frank et al., 2016b). To address whether the photoswitchable properties of caCers can also be exploited in native cellular membranes, we first monitored their metabolic conversion into SM by human SMS2 heterologously expressed in yeast. To this end, caCers were kept in the dark or pre-irradiated with blue or UV-A light, and then incubated with lysates of yeast cells transfected with V5-tagged SMS2 or an empty vector (EV) (Figure 3a,b). A clickable ceramide analogue lacking the azobenzene moiety, cCer (Figure 1c), served as control. Next, the lipids were extracted, click-reacted with a fluorophore, separated by thin layer chromatography (TLC) and analyzed for fluorescence. To detect the clickable lipids, we initially used 3-azido-7-hydroxycoumarin as a fluorogenic click-reagent (Sivakumar et al., 2004; Thiele et al., 2012). However, this resulted in a distance-dependent intramolecular quenching of the coumarin fluorescence by the caCer azobenzene moiety (Figure 3—figure supplement 1). As Alexa-647 has no spectral overlap with the azobenzene, Alexa-647-azide was used in all subsequent click reactions. All four caCers and cCer were converted into SM when incubated with lysates of SMS2-expressing yeast cells (Figure 3c). No conversion was observed in lysates of control (EV) cells. 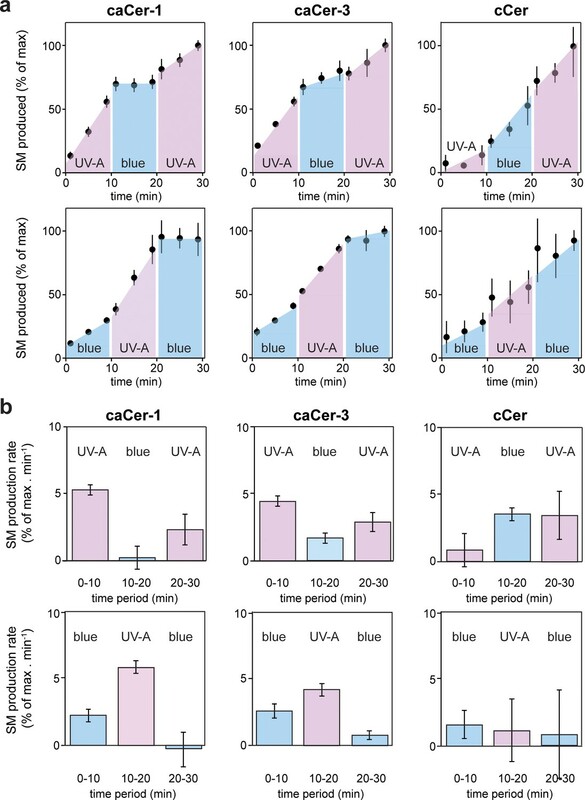 Strikingly, the cis (UV-A-irradiated) isomers of both caCer-1 and caCer-2 were more efficiently metabolized by SMS2 than their corresponding trans (dark-adapted or blue-irradiated) isomers. caCer-3 behaved similarly to caCer-1 and caCer-2, except that its blue irradiation led to a higher metabolic conversion by SMS2 (Figure 3c). In contrast, the SMS2-mediated conversion of both caCer-4 and cCer was independent of light treatment. The same trends were observed when the click reaction was omitted, and the azobenzene-containing lipids were visualized using the UV-absorbing properties of the azobenzene group (Figure 3—figure supplement 2). 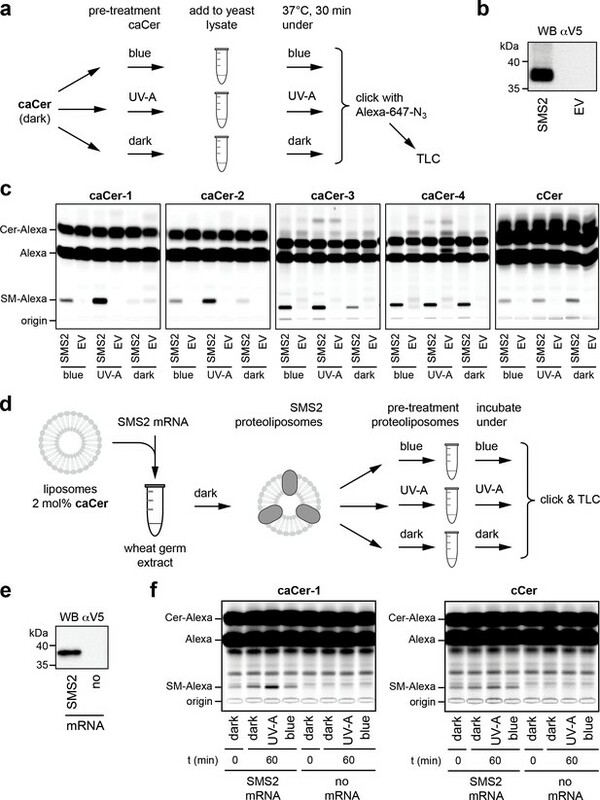 caCers are light-sensitive substrates of sphingomyelin synthase SMS2. (a) Blue, UV-A or dark-adapted caCers were incubated with lysates of control or SMS2-expressing yeast cells for 30 min at 37°C and their metabolic conversion to SM was determined by TLC analysis of total lipid extracts click-reacted with Alexa-647. (b) Lysates of yeast cells transfected with empty vector (EV) or V5-tagged SMS2 were analyzed by immunoblotting with an anti-V5 antibody. (c) Lysates of control (EV) and SMS2-expressing yeast cells were incubated with caCers or cCer as outlined in (a). Reaction samples were subjected to lipid extraction, click-reacted with Alexa-647 and analyzed by TLC. (d) SMS2 was produced cell-free in the dark at 26°C in the presence of caCer-containing liposomes and then incubated at 37°C in the dark or upon illumination with blue or UV-A light. Reaction samples were subjected to lipid extraction, click-reacted with Alexa-647 and analyzed by TLC. (e) Cell-free translation reactions with or without SMS2-V5 mRNA were analyzed by immunoblotting with an anti-V5 antibody. (f) SMS2 was produced cell-free in the presence of caCer-1 or cCer-containing liposomes and then incubated for 0 or 60 min at 37°C as outlined in (d). Reaction samples were subjected to lipid extraction, click-reacted with Alexa-647 and analyzed by TLC. To exclude the possibility that the light-dependent metabolic conversion of caCers was merely due to differences in the efficiency by which externally added trans- and cis-isoforms were incorporated into SMS2-containing membranes, we produced SMS2 cell-free in the presence of liposomes already containing the caCer probe (Figure 3d,e). Here, we focused on caCer-1, as the metabolic conversion of this compound in SMS2-containing lysates was most strongly influenced by light (Figure 3c). During the liposome-coupled translation of SMS2 mRNA overnight at 26°C, only trace amounts of dark-adapted caCer-1 were converted into SM (Figure 4f, t = 0). Extending the incubation by 1 hr at 37°C in the dark resulted in only a minor increase in the amount of SM formed. However, extending the incubation under pulsed UV-A illumination led to a rise in the amount of SM produced. In contrast, blue illumination did not enhance SM production relative to the dark-adapted liposomes. No such light-induced fluctuations in SM production were observed with liposomes containing cCer. Omission of SMS2 mRNA abolished SM formation altogether (Figure 3f). Collectively, these results indicate that light-induced conformational changes in caCers have an acute impact on their metabolic conversion by SMS2 in both synthetic and cellular membranes. Metabolic conversion of caCers by SMS2 in cell lysates can be switched on and off by light. (a) caCer-1, caCer-3 or cCer were incubated with lysates of SMS2-expressing yeast cells at 37°C under UV-A or blue illumination. After each 10 min period, the caCer configuration was switched by illuminating the reactions with blue or UV-A light. Reaction samples were taken at the indicated time points, subjected to lipid extraction, click-reacted with Alexa-647 and then analyzed by TLC. Presented are the relative amounts of SM formed per time point. (b) Presented are the relative SM production rates (a.u. of SM formed per min) calculated from the time points presented in (a). Data shown are average values ± s.d. from four technical replicates (n = 4). We next examined whether metabolic conversion of caCers by SMS2 can be controlled in a reversible manner using the temporal precision of light. Cis- or trans-isomers of caCer-1 and caCer-3 were added to lysates of SMS2-expressing yeast cells, and the reactions were then incubated at 37°C under different light regimes. After each 10 min period, the caCer configuration was switched by illuminating the reactions with blue or UV-A light. The amount of SM formed was monitored over time by TLC analysis of Alexa-647-clicked reaction samples. The efficiency by which both caCer-1 and caCer-3 were converted into SM increased instantly upon their isomerization to cis with UV-A light (Figure 4). Conversely, isomerization back to trans with blue light resulted in an abrupt drop in the SM production rate. This block in SM production could be reversed again by illuminating the samples with UV-A light. These trends could be repeated over two cycles with two different light regimes (Figure 4a,b), thus enabling the generation of time-resolved pulses of SM synthesis. In line with our foregoing data, the light-induced changes in SM production rates were more pronounced for caCer-1 than for caCer-3, and metabolic conversion of cCer into SM was not affected by UV-A or blue irradiation (Figure 4a,b). To investigate whether caCers also enable optical control over SM biosynthesis in living cells, we used SMS2-overexpressing HeLa cells generated by stable transfection with a V5-tagged SMS2 expression construct (Figure 5a). As expected, immunofluorescence microscopy revealed that the bulk of SMS2-V5 resides at the plasma membrane (Figure 5b,c) (Huitema et al., 2004; Tafesse et al., 2007). Next, control and SMS2-overexpressing HeLa cells were incubated with externally-added cis- (UV-A-irradiated) or trans- isomers (blue-irradiated or dark-adapted) of caCer-1 and caCer-3 for 1 hr at 37°C, and their conversion into SM was determined by TLC analysis of Alexa-647-clicked total lipid extracts. The overall yield of SM produced in SMS2-overexpressing cells was at least threefold higher than that in control cells, regardless of the caCer isomer used (Figure 5d–g). However, in both control and SMS2-overexpressing cells, cis-caCer-1 was more efficiently metabolized into SM than the trans-isomer (Figure 5d,e), and similar results were obtained with caCer-3 (Figure 5f,g). 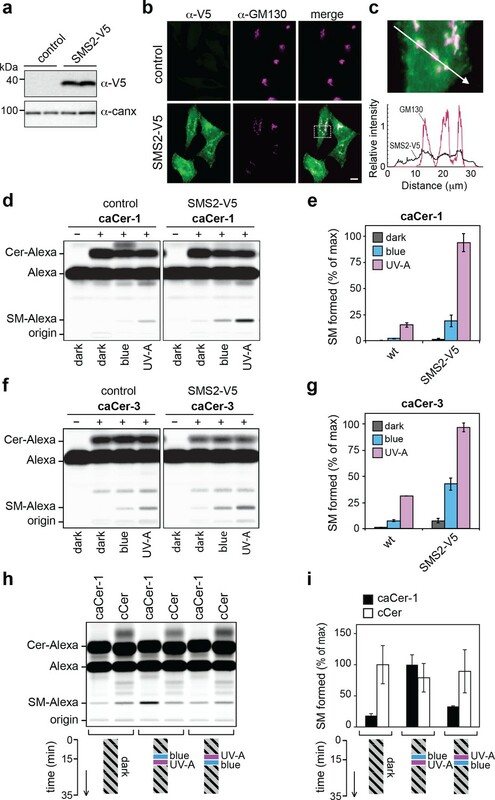 caCers enable optical control of SMS2-mediated SM biosynthesis in living cells. (a) HeLa cells stably transfected with V5-tagged SMS2 were analyzed by immunoblotting using anti-V5 and anti-calnexin antibodies. Untransfected HeLa cells served as control. (b) Control and SMS2-V5-expressing HeLa cells were fixed, co-stained with antibodies against the V5 epitope and Golgi marker GM130, and then visualized by fluorescence microscopy. Scale bar, 10 μm. (c) Intensity plots along the path marked by the white arrow, showing overlap between anti-V5 (green) and anti-GM130 (magenta) channels. (d) Blue, UV-A or dark-adapted caCer-1 was incubated with control or SMS2-V5-expressing HeLa cells for 1 hr at 37°C. 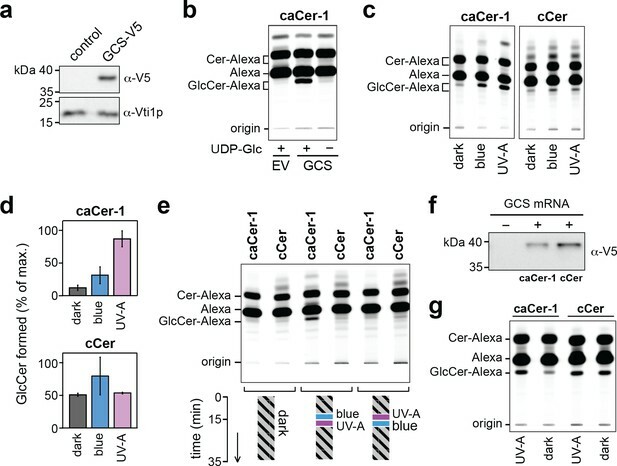 Metabolic conversion of caCer-1 to SM was determined by TLC analysis of total lipid extracts click-reacted with Alexa-647. (e) Quantitative analysis of SM formed from caCer-1 by cells treated as in (c). (f) Blue, UV-A or dark-adapted caCer-3 was incubated with control or SMS2-V5-expressing HeLa cells for 1 hr at 37°C and its metabolic conversion to SM was determined as in (c). (g) Quantitative analysis of SM formed from caCer-3 by cells treated as in (e). (h) caCer-1 or cCer were incubated with SMS2-V5-expressing HeLa cells at 37°C in the dark. After 15 min, cells were flash-illuminated by blue light followed by UV-A or vice versa and then incubated for another 20 min. Cells kept in the dark for the entire incubation period served as control. Metabolic conversion of caCer-1 or cCer to SM was determined by TLC analysis of total lipid extracts click-reacted with Alexa-647. (i) Quantitative analysis of SM formed from caCer-1 or cCer by cells treated as in (g). Data shown are mean values ± s.d. from three biological replicates (n = 3). To address whether the rate of SM production in living cells could be controlled reversibly, SMS2-overexpressing cells were incubated with a trans (dark-adapted) isomer of caCer-1 or with cCer for 15 min at 37°C in the dark. Cells were then flash-illuminated with blue followed by UV-A light or vice-versa, and then incubated for another 20 min in the dark. Cells that did not receive any light treatment and that were kept in the dark throughout the incubation period served as baseline for the conversion of the trans-isomer only. The amount of SM formed was then determined by TLC analysis of Alexa-647-clicked total lipid extracts. Cells treated first with UV-A followed by blue-light produced similar amounts of SM as cells kept in the dark (Figure 5h,i). However, treating cells first with blue light followed by UV-A light caused a marked (3–5-fold) increase in SM production. In contrast, production of SM from cCer was not affected by light treatment, demonstrating that UV-A irradiation itself did not affect SM-production in HeLa cells. Taken together, these results demonstrate the suitability of caCers as photoswitchable substrates for manipulating SM biosynthesis in living cells with the temporal precision of light. Finally, we addressed whether caCers can be used as light-sensitive substrates of other sphingolipid biosynthetic enzymes. We employed a yeast strain expressing human glucosylceramide synthase (GCS; Figure 6a), a Golgi-resident enzyme structurally unrelated to SMS2 that generates glucosylceramide (GlcCer) by transferring glucose from UDP-glucose to ceramide. When incubated with lysates of GCS-expressing yeast cells in the presence of UDP-glucose, UV-A-irradiated caCer-1 was converted to GlcCer (Figure 6b). No GlcCer was formed when UDP-glucose was omitted or when yeast lysates that lack GCS were used. Analogous to our results with SMS2, metabolic conversion of caCer-1 by GCS was light sensitive, with the cis-isomers being more readily converted to GlcCer than the trans-isomers (Figure 6c,d). To address whether the rate of GlcCer production from caCers could be reversibly manipulated, GCS-containing yeast lysates were incubated with a trans (dark-adapted) isomer of caCer-1 or with cCer for 15 min at 37°C in the dark. The lysates were then flash-illuminated with blue light followed by UV-A light or vice-versa, and then incubated for another 20 min in the dark. Subjecting trans-caCer-1-containing lysates to an ‘off-ON’ switching regime (blue then UV-A) enabled GlcCer production (Figure 6e). In contrast, keeping the lysates in the dark or subjecting them to an ‘on-OFF’ switching regime (UV-A then blue) blocked GlcCer production. In lysates containing cCer, GlcCer production was independent of light (Figure 6c–e). To conclude, we produced GCS cell-free in the presence of UDP-glucose and liposomes that contained either dark-adapted caCer-1 or cCer (Figure 6f). While only small amounts of GlcCer were formed when caCer-1-containing proteoliposomes were kept in the dark, GlcCer production was strongly stimulated by UV-A illumination (Figure 6g). In contrast, GlcCer production in cCer-containing proteoliposomes was insensitive to UV-A illumination. Importantly, these results demonstrate that the application of caCers as light-sensitive substrates is not restricted to one particular class of ceramide metabolic enzymes. caCer-1 is a light-sensitive substrate of glucosylceramide synthase GCS. (a) Lysates of yeast cells transfected with V5-tagged GCS or empty vector (EV; control) were analyzed by immunoblotting using anti-V5 and anti-Vti1p antibodies. (b) UV-A pretreated caCer-1 (25 μM) was incubated with lysates of control or GCS-expressing yeast cells for 30 min at 37°C in the presence or absence of 1 mM UDP-glucose. Reactions were subjected to lipid extraction, click-reacted with Alexa-647 and then analyzed by TLC. (c) UV-A, blue or dark pretreated caCer-1 and cCer (25 μM, each) were incubated in the dark for 30 min at 37°C with lysates of GCS-expressing yeast in the presence of 1 mM UDP-glucose and analyzed as in (b). (d) Quantitative analysis of GlcCer formed from caCer-1 or cCer in lysates treated as in (c). (e) Dark-adapted caCer-1 or cCer (25 μM, each) and UDP-glucose (1 mM) were incubated with lysates of GCS-expressing yeast in the dark at 37°C. After 15 min, lysates were flash-illuminated by blue light followed by UV-A or vice versa and then incubated for another 20 min. Lysates kept in the dark for the entire incubation period served as control. GlcCer formation was determined by TLC analysis of total lipid extracts click-reacted with Alexa-647. (f) Cell-free translation reactions with or without GCS-V5 mRNA were carried out overnight in the dark at 26°C. GCS was expressed in the presence of liposomes containing caCer-1 or cCer and then analyzed by immunoblotting using an anti-V5 antibody. (g) GCS produced cell-free as in (f) was flash-illuminated with UV-A or kept in the dark and then incubated with 1 mM UDP-glucose for 30 min at 37°C in the dark. GlcCer formation was monitored by TLC as in (e). Data shown are average values ± s.d. (cCer, n = 2; caCer-1, n = 3). Studies of lipid function traditionally revolve around an extended central dogma of molecular biology: that proteins control cellular lipid pools by catalyzing lipid metabolism and transport. As such, interrogating lipid function by manipulating gene expression or protein activity is intrinsically slow and indirect. Photo-activated lipids allow one to probe lipid function in a more acute and direct manner using the unmatched temporal precision of light. Here, we report on caCers, a new generation of clickable and azobenzene-containing ceramide analogs that enable optical control over sphingolipid production in living cells. Isomerization of the azobenzene photoswitch triggers conformational changes in the carbon chains of caCers that either block or facilitate their metabolic conversion by SMS2 and GCS, two key sphingolipid biosynthetic enzymes in mammals. Our finding that these light-induced effects are instant, reversible and occur in native cellular membranes opens up unprecedented opportunities to manipulate the metabolic fate and biological activity of sphingolipids at the subcellular level in real time. Using synthetic and cellular membrane systems as experimental models, we found that cis-isomers of caCer-1, caCer-2 and caCer-3 are more readily metabolized by SMS2 than their corresponding trans-isomers. These observations may seem counterintuitive at first, as trans-caCers resemble natural ceramides more closely than cis-caCers, possessing kinked carbon chains instead of straight ones. One explanation for this may be that the trans-azobenzene moiety interferes with high-affinity binding of caCers to the ceramide binding pocket in SMS2, for instance because the enzyme preferentially accommodates substrates with bent carbon chains (Figure 7a). However, this theory conflicts with the finding that SM synthases are relatively tolerant toward structural deviations in the ceramide backbone and readily metabolize ceramide analogous with distinct functional groups in the sphingoid base or N-acyl chain (Koval and Pagano, 1991; Huitema et al., 2004; Haberkant et al., 2016). Moreover, the unrelated enzyme GCS also converts cis-caCers more rapidly, suggesting that a general biophysical property of the caCers underlies this phenomenon. Models of how photoswitchable ceramides may enable optical control over sphingolipid biosynthesis and signaling. 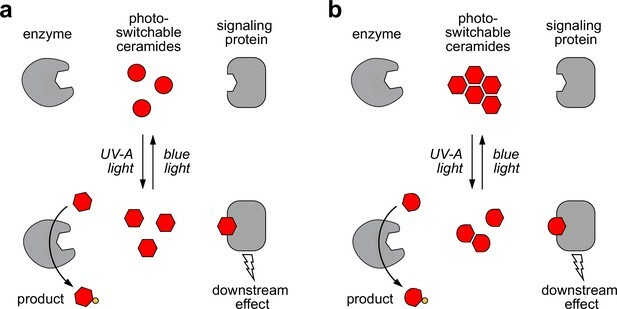 (a) UV-A or blue light trigger alterations in the curvature of the carbon chains of azobenzene-containing ceramides (caCers), which reversibly enhance or reduce their affinity for ceramide metabolic enzymes and signaling proteins. (b) Blue light triggers self-assembly of photoswitchable ceramides (caCers) into tightly packed clusters driven by intermolecular stacking of the flat trans-azobenzene groups. In contrast, UV-A light causes caCers to disperse in the plane of the membrane as the bent cis-azobenzene groups disrupt intermolecular stacking. 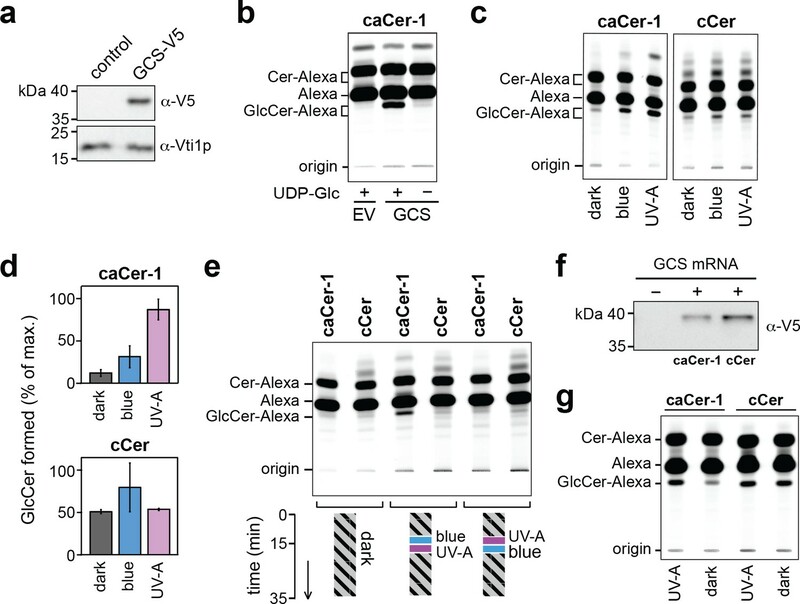 These light-induced changes in lateral packing of caCers reversibly enhance or reduce their availability for metabolic conversion or stimulating ceramide signaling proteins. Based on our findings in SLBs, we hypothesize that the impact of cis-trans isomerization on the metabolic fate of caCers may be caused by light-induced alterations in their lateral packing (Figure 7b). According to this model, trans-caCers form tightly packed clusters due to favorable intermolecular stacking interactions among the flat trans-azobenzene groups, thereby reducing their availability for enzymatic conversion. On isomerization to cis, the kinked caCer molecules become dispersed throughout the membrane, making them more accessible for enzymatic conversion. This idea is supported by our finding that trans-caCers preferentially localize in liquid-ordered (Lo) domains in model bilayers (Figure 2) (Frank et al., 2016b). caCer-4 forms an exception, as its isomerization to trans promotes association with Lo domains without having an obvious impact on SM biosynthesis. While both caCer-3 and caCer-4 have azobenzene-containing sphingoid bases, caCer-4 is unique among all caCers in that its azobenzene photoswitch is positioned close to the end of the carbon chain. Conceivably, isomerization of this compound to trans may lead to a less pronounced clustering in cellular membranes. A distinct advantage of caCers over caged ceramide analogs (Kim et al., 2016; Höglinger et al., 2014; Höglinger et al., 2015) is that their activity can be readily switched off by light. This property enabled us to generate time-resolved pulses of SM synthesis at the plasma membrane of living cells. In comparison to traditional pulse-chase approaches, our method offers superior temporal resolution for manipulating sphingolipid levels, and could be combined with patterned illumination to generate controlled sphingolipid pulses in subpopulations of cells or in subcellular organelles. An attractive prospect is to use cis-trans isomerization to bring caCers within reach of the binding pocket of a ceramide signaling protein, or to pull them away, thus enabling instant and reversible control over ceramide-operated signaling pathways (Figure 7). Accordingly, caCers may find use in dissecting the causal roles of ceramides in apoptosis, as tumor suppressors, and as antagonists of insulin signaling (Hannun and Obeid, 2018; Jain et al., 2017; Park et al., 2016; Meikle and Summers, 2017). In fact, light-induced changes in lateral packing may be a previously unnoted characteristic of other azobenzene-containing signaling lipids like DAGs, where the cis-isomers correspond to the bioactive form (Frank et al., 2016a; Leinders-Zufall et al., 2018). Application of caCers in living cells is hampered by their relatively poor aqueous solubility. However, the development of photoswitchable sphingoid bases may provide a way to circumvent limitations associated with the relative inefficient uptake of caCers by cells, thus expanding opportunities for manipulating the metabolic fate and signaling activity of sphingolipids by light. 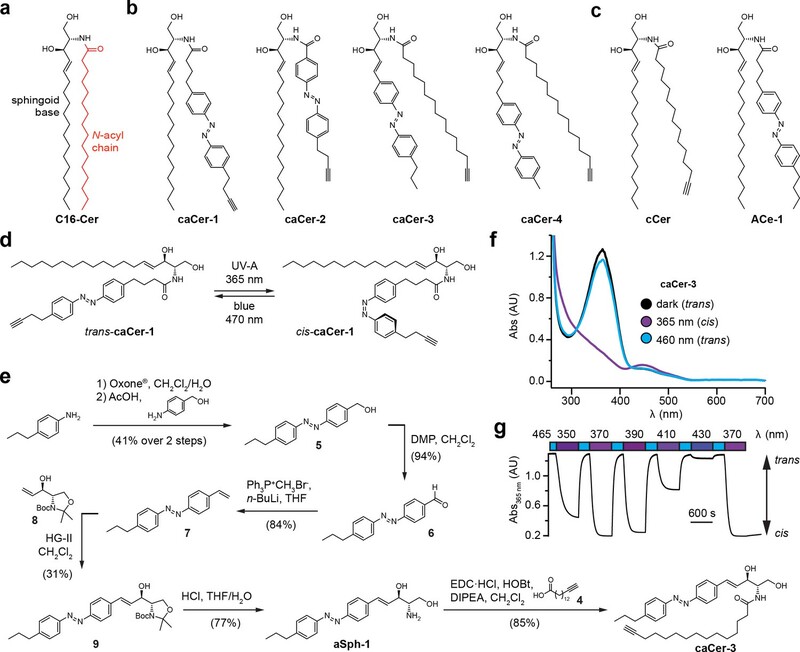 Ceramides are the precursors of a large collection of complex sphingolipids with critical roles in sustaining mechanical stability, molecular sorting, cell signaling, migration and adhesion. Consequently, caCers provide attractive scaffolds for creating a new toolbox of photoswitchable sphingolipids to enable optical control over a wide array of sphingolipid-mediated cellular processes. Clickable ceramide (cCer) was synthesized as previously described (Kol et al., 2017). Unless otherwise stated, all reactions were performed with magnetic stirring under a positive pressure of nitrogen or argon gas. Tetrahydrofuran (THF) and diethyl ether (Et2O) were distilled over sodium benzophenone under nitrogen atmosphere prior to use. Dichloromethane (CH2Cl2) and triethylamine (Et3N) were distilled over calcium hydride under a nitrogen atmosphere. N,N-dimethylformamide (DMF), toluene (PhMe), dioxane and methanol (MeOH) were purchased from Acros Organics as 'extra dry' reagents under inert gas atmosphere and stored over molecular sieves. Ethyl acetate (EtOAc), pentane, Et2O, CH2Cl2 and MeOH used specifically for extraction and flash column chromatography were purchased at technical grade from commercial sources and distilled under reduced pressure. Solvents and reagents were used as received from commercial sources (Sigma-Aldrich, Tokyo Chemical Industry Co., Alfa Aesar, Acros Organics, Strem Chemicals). Reactions were monitored by thin-layer chromatography (TLC) using silica gel F254 pre-coated glass plates (Merck) and visualized by exposure to ultraviolet light (λ = 254 nm) or by staining with aqueous potassium permanganate (KMnO4) solution (7.5 g KMnO4, 50 g K2CO3, 6.25 mL aqueous 10% NaOH, 1000 mL distilled H2O), aqueous acidic ceric ammonium molybdate (IV) (CAM) solution (2.0 g Ce(NH4)4(SO4)4·2H2O, 48 g (NH4)6Mo7O24·4H2O, 60 mL concentrated sulfuric acid, 940 mL distilled H2O) or a butanolic ninhydrin solution (13.5 g ninhydrin, 900 mL n-BuOH, 27 mL acetic acid) followed by heating with a heat gun (150–600°C). Flash column chromatography was performed using silica gel (60 Å, 40–63 µm, Merck). Proton (1H) and carbon (13C) nuclear magnetic resonance spectra were recorded on a Bruker Avance III HD 400 MHz spectrometer equipped with a CryoProbe or a Varian VXR400 S spectrometer. Proton chemical shifts are expressed in parts per million (ppm, δ scale) and referenced to residual undeuterated solvent signals. Carbon chemical shifts are expressed in parts per million (ppm, δ scale) and referenced to the central carbon resonance of the solvent. The reported data is represented as follows: chemical shift in parts per million (ppm, δ scale) (multiplicity, coupling constants J in Hz, integration intensity, proton assignment). Abbreviations used for analysis of multiplets are as follows: s (singlet), br s (broad singlet), d (doublet), t (triplet), q (quartet), p (pentet), h (hextet), and m (multiplet). Variable temperature NMR spectroscopy was performed at the Ludwig-Maximilians-Universität NMR facility. IR spectra were recorded on a PerkinElmer Spectrum BXII FTIR spectrometer equipped with an attenuated total reflection (ATR) measuring unit. IR data is recorded in frequency of absorption (wavenumber in cm−1). Mass spectrometry (MS) experiments were performed at high resolution on a Thermo Finnigan MAT 95 (electron ionization [EI] double-focusing magnetic sector mass spectrometer) or on a Thermo Finnigan LTQ FT (electrospray ionization [ESI] linear ion trap-based Fourier transform ion cyclotron resonance mass spectrometer) instrument at the Ludwig-Maximilians-Universität mass spectrometry facility. Melting points were measured using a Stanford Research Systems MPA120 Automated Melting Point Apparatus in open capillaries and are uncorrected. N-Stearoyl-d-erythro-sphingosine (C18:0-Cer), N-stearoyl-d-erythro-sphingosylphosphoryl-choline (C18:0-SM), 1,2-dioleoyl-sn-glycero-3-phosphocholine (DOPC) and cholesterol were purchased from Avanti Polar Lipids (Alabaster, AL, USA). We prepared supported lipid bilayers (SLBs) by deposition and fusion of small unilamellar vesicles (SUVs) as described elsewhere (Chiantia et al., 2006). SUVs composed of DOPC:cholesterol:SM:caCer, containing additional 0.1 mol% ATTO655-DOPE (ATTO Technology GmbH, Siegen, Germany), were obtained by bath sonication of multilamellar vesicles. SUV suspensions (1 mM total lipid concentration in buffer containing 10 mM HEPES, 150 mM NaCl, pH 7.4) were deposited in the presence of 2 mM CaCl2 on freshly-cleaved mica glued to glass coverslips. The samples were incubated at 65 ˚C for 30 min, rinsed with buffer and then allowed to cool slowly to room temperature for at least 1 hr. Combined atomic force and confocal microscopy was performed on a JPK Instruments Nanowizard III BioAFM and Nanowizard Ultra (Berlin, Germany) mounted on a Zeiss LSM510 Meta laser scanning confocal microscope (Jena, Germany). High-speed AFM in AC mode was done with the Nanowizard Ultra head, utilizing USC-F0.3-k0.3 ultra-short cantilevers from Nanoworld (Neuchâtel, Switzerland) with typical stiffness of 0.3 N/m. The cantilever oscillation was tuned to a frequency of 100–150 kHz and the amplitude kept below 10 nm. The scan rate was set to 25–150 Hz. Images were acquired at 256 × 256 pixel resolution. All measurements were performed at room temperature. The force applied on the sample was minimized by continuously adjusting the set point and gain during imaging. Height, error, deflection and phase-shift signals were recorded and images were line-fitted as required. Data was analyzed using JPK data processing software Version 5.1.4 (JPK Instruments) and Gwyddion Version 2.30 (Czech Metrology Institute). For the confocal measurements, a 633 nm He-Ne laser (to excite the 0.1 mol% ATTO655-DOPE added to the lipid mixtures) and a 40 × NA 1.2 UV-VIS-IR C Apochromat water-immersion objective were used. All measurements were performed at room temperature. Images were typically acquired with a 512 × 512 pixel resolution at a scan rate of 3.2 μs/pixel and using a 1 Airy pinhole. Images were further processed with Fiji software (http://fiji.sc/Fiji). Compound switching for combined atomic force and confocal microscopy was achieved using a CoolLED pE-2 LED light source (Andover, United Kingdom) for illumination at 365 and 470 nm. The light source was operated at a maximum of 80% power. The light beam was guided by a fiber-optic cable directly through the objective of the microscope via a collimator at the backport side of the microscope. The open reading frames of human SMS2 (uniProt entry Q8NHU3) and GCS (uniProt entry Q16739) were PCR amplified and cloned into the pYES2.1/V5-His TOPO vector (Invitrogen) according to the manufacturer's instructions. Yeast strain IAY11 (MATα, ade2-1 trp1-1 can1-100 leu2-3,112 his3-11,15 ura3-52 ade3-Δ853) was transformed with pYES2.1/SMS2-V5-His, pYES2.1/GCS-V5-His, or an empty vector control. For SMS2 expression, yeast was grown at 30°C in synthetic medium containing 2% (w/v) galactose to early mid-logarithmic phase. For GCS expression, yeast was grown in synthetic medium with 2% (w/v) glucose to mid-log phase, washed twice with sterile water, and then grown in synthetic medium with 2% (w/v) galactose for 4 hr. Cells were collected by centrifugation and washed in ice-cold Buffer R (15 mM KCl, 5 mM NaCl, 20 mM HEPES/KOH pH 7.2). The wet cell pellet (2 g) was resuspended in buffer R (5 mL) containing protease inhibitor cocktail (PIC, 1 μg/mL aprotinin, 1 μg/mL leupeptin, 1 μg/mL pepstatin, 5 μg/mL antipain, 1 mM benzamidine and 1 mM phenylmethanesulfonyl fluoride). The cells were lysed by vigorous vortexing with glass beads (3 g) at 4 ˚C with intermittent cooling on ice. Post-nuclear supernatants were prepared by centrifugation at 700 xg for 10 min at 4 ˚C. The PNS of GCS-expressing yeast was centrifuged at 100,000 xg for 1 hr at 4°C and the resulting membrane pellet was resuspended in buffer R. After addition of 0.11 vol of glycerol, the PNS and resuspended membranes were aliquoted, snap-frozen in liquid nitrogen and stored at −80 ˚C. Protein concentration of PNS and membrane samples was determined by Bio-Rad Protein Assay (Bio-Rad GmbH, Munich, Germany). PNS of control or SMS2-expressing yeast were diluted to 0.3 mg/mL (Figure 3c) or 0.6 mg/mL total protein (Figure 4) in Buffer R supplemented with PIC and 0.5 mM N-ethylmaleimide, and kept on ice in 4 mL brown glass vials. Stocks of cCer and caCers (2 mM in EtOH) were stored in the dark at −20 ˚C in 1.8 mL brown glass vials with ethylene-tetrafluoroethylene (ETFE)-coated rubber seals. After pre-treatment with high intensity illumination at 365 or 470 nm using a CoolLED pE-2 (80% power, 1 min, on ice), cCer and caCers were added to 400 μl PNS at a final concentration of 25 μM and immediately vortexed. After 10 min on ice in the dark, the reactions were shifted to 37 ˚C for 30 min and kept in the dark or subjected to low intensity flash illumination (pulse of 75 ms with 15 s interval) with UV-A (~365 nm) or blue light (~460 nm) from the top of the reaction tube using a home-built, 24 well plate-compatible pulsed LED illumination setup (Borowiak et al., 2015) while shaking at 30 rpm. For photoswitch experiments (Figure 4, time point t = 10 min and t = 20 min), the reactions were subjected to high intensity illumination at 365 or 470 nm with a CoolLED pE-2 (80% power) for 20 s at 25 ˚C and then incubated again at 37 ˚C in the dark. Membrane suspensions of control or GCS-expressing yeast were diluted to 0.6 mg/mL total protein in Buffer R and supplemented with 1 mM UDP-glucose. Light-treated or dark-adapted cCer and caCers were added to 400 μl of membrane suspension at a final concentration of 25 μM in 4 mL brown glass vials and then incubated at 37 ˚C for 30 min in the dark with gentle shaking. Reactions were stopped by addition of 3.75 vol CHCl3:MeOH (1:2 vol:vol) and stored at −20 ˚C. The open reading frames of human SMS2 and GCS were PCR amplified in-frame with a C-terminal V5 epitope, cloned into wheat germ expression vector pEU-Flexi, and subjected to in vitro transcription and translation as described (Kol et al., 2017). Translation of SMS2 and GCS transcripts was incubated overnight at 26 ˚C in the dark in the presence of liposomes (2 mM) comprising egg PC:egg PE:wheatgerm PI:cCer/caCer (40:40:20:2 molar ratio). Next, translation reactions were split into four aliquots. One aliquot served as the t = 0 control, and the other three were treated either with UV-A or blue light, or kept in the dark, and subsequently incubated for 1 hr at 37 ˚C under pulsed LED illumination or in the dark to record SMS2 activity. For GCS activity, 1 mM UDP-glucose was added directly prior to splitting and light treatment, and the reactions were incubated for 30 min at 37 ˚C. Reactions were stopped by addition of 3.75 vol of CHCl3:MeOH (1:2 vol:vol) and stored at −20 ˚C. HeLa cells (ATTC CCL-2) were cultured in DMEM supplemented with 9% FBS (PAN Biotech P40-47500) at 37 ˚C under 5% CO2. HeLa cells were mycoplasma free. HeLa cells stably transfected with pcDNA3.1-SMS2-V5-His-TOPO (Huitema et al., 2004) were cultured in the presence of 400 μg/mL G418 (Biochrom A291-25). Cells were seeded at 200,000–300,000 cells per well of a 6-well plate (Greiner CellStar 657160). After 8 hr, 4 mM sodium butyrate (SantaCruz SC 202341A, 1 M stock in H2O) was added. After another 16 hr, the cells were washed with PBS and then incubated in 1 mL phenol red-free Optimem (Gibco 11058–021, Thermo Scientific) per well. Stock solutions of cCer and caCers (2 mM in DMSO, Applichem A3672) were pre-treated with high intensity illumination at either 365 or 470 nm with a CoolLED pE-2 (80% power) for 1 min on ice or kept in the dark, and then immediately added to the Optimem on the cells under reduced light conditions. Incubations were performed at 37 ˚C under 5% CO2 in the dark (Figure 5c–f). Cells were trypsinized, re-suspended and harvested in 1 mL PBS supplemented with PIC. Cells were then pelleted at 900 xg for 5 min at 4 ˚C. After removal of 900 μl of supernatant, the cell pellet was re-suspended in the remaining 100 μl and 375 μl CHCl3:MeOH (1:2 vol:vol) was added before samples were stored at −20 ˚C. For live switch experiments (Figure 5g,h), cells were grown and treated with butyrate in T75 flasks, as described above. Cells were trypsinized, collected in DMEM, pelleted at 600 xg for 5 min at RT, washed with phenol red-free Optimem and then resuspended at ±8×106 cells/mL in phenol red-free Optimem. From this cell suspension, 100 μl aliquots were transferred to 1.8 mL brown vials, supplemented with 60 μM dark-adapted cCer or caCer-1 (from 2 mM stocks in DMSO) and incubated at 37 ˚C under 5% CO2 in the dark with gentle shaking at 600 rpm. Light treatment was performed by high intensity illumination for 30 s at 20 ˚C with a CoolLED pE-2 at either 365 or 470 nm, 80% power output. Reactions were stopped by addition of 375 μl CHCl3:MeOH (1:2 vol:vol) and stored at −20 ˚C. Expression of V5-tagged SMS2 or GCS was verified by immunoblot analysis using a mouse monoclonal anti-V5 antibody (ThermoFisher, cat. no. R960-25, 1:4000). Rabbit polyclonal anti-calnexin (Santa Cruz, cat. no. SC11397, 1:2000) and anti-Vti1p antibodies (kind gift from Christian Ungermann, University of Osnabrück, 1:2000) served as controls. Goat-anti-mouse and goat-anti-rabbit IgG HRP conjugates were obtained from ThermoFisher (cat. no. 31430, 1:4000) and Biorad (cat. no. 1706515, 1:4000), respectively. For detection, Pierce ECL reagent (ThermoFisher, cat. no. 32106) was used. Immunoblots were processed using a ChemiDoc XRS + system (Bio-Rad) and ImageLab software. Lipid extractions were performed in Eppendorf Protein LoBind tubes with a reference volume (one vol) of 100 μl (sample) in 3.75 vol (375 μl) CHCl3:MeOH. After centrifugation at 21,000 xg for 10 min at 4 ˚C, the supernatant was collected and transferred to a fresh tube containing one vol CHCl3 and 1.25 vol 0.45% NaCl to induce phase separation. After vigorous vortexing for 5 min at RT and subsequent centrifugation (5 min, 21,000 xg, RT), the organic phase was transferred to a fresh tube containing 3.5 vol MeOH:0.45% NaCl (1:1 vol:vol). After vigorous vortexing for 5 min at RT and subsequent centrifugation (5 min, 21,000 xg, RT), the organic phase (1.8 vol) was collected and used for derivatization with clickable fluorophores. Clickable fluorophores 3-azido-7-hydroxycoumarin (Jena Bioscience) and Alexa-647-azide (Thermo Fisher) were dissolved in CH3CN to a final concentration of 10 mM and 2 mM, respectively, and stored at −20 ˚C. Lipid extracts were transferred to Eppendorf Protein LoBind tubes, dried down in a speedvac and dissolved in 10 μl CHCl3 (initial experiments) or directly dissolved in click mix (later experiments), as indicated. The alkyne-functionalized lipids in 10 μl CHCl3 were clicked to 3-azido-7-hydroxycoumarin or Alexa647-azide by incubation with 43 μl of a freshly prepared click reaction solution containing 0.45 mM of the clickable fluorophore and 1.4 mM tetrakis(acetonitrile)copper(I) tetrafluoroborate in CH3CN:EtOH (3:7, vol:vol) for 4 hr at 40 ˚C, followed by 12 hr at 12 ˚C without shaking (Gaebler et al., 2013). The reaction was quenched by the addition of 150 μl MeOH, dried down in a Christ RVC 2–18 speedvac under reduced pressure from a Vacuubrand MZ 2C diaphragm vacuum pump, and dissolved in CHCl3:MeOH (2:1, vol:vol). In later experiments, dried lipid films were directly dissolved in 25 μl of click mix. The click-mix was composed of CHCl3:CH3CN:EtOH (19:16:66, vol:vol:vol), in which Alexa-647 was present at an equimolar ratio with respect to the calculated amount of alkyne lipid (assuming 100% lipid recovery from the extraction). The tetrakis(acetonitrile)copper(I) tetrafluoroborate was present as at 20-fold molar excess with respect to the fluorophore. After incubation for 4 hr at 40 ˚C and 12 hr at 12 ˚C without shaking, the reaction mixtures were directly loaded on TLC. Click-reacted lipid extracts were applied at 120 nl/s to NANO-ADAMANT HP-TLC plates (Macherey and Nagel) using a CAMAG Linomat 5 TLC sampler. The TLC was developed in CHCl3:MeOH:H2O:AcOH (65:25:4:1, vol:vol:vol:vol) using the CAMAG ADC2 automatic TLC developer operated as follows: 30 s plate pre-drying, 5 min humidity control (against saturated KSCN solution), 10 min tank saturation with eluent, after which the TLC was developed until the front reached 85 mm height, and then dried for 5 min. Coumarin-derivatized and unclicked azobenzene lipids were analyzed using a ChemiDoc XRS + imager with UV-trans-illumination (detection settings for Ethidium Bromide - standard filter) and Quantity One software (Bio-Rad). Alexa-647 derivatized lipids were visualized on TLC using a Typhoon FLA 9500 Biomolecular Imager (GE Healthcare Life Sciences) operated with 650 nm excitation laser, LPR filter, 50 μm pixel size and PMT voltage setting of 290 V. The amount of Alexa-647-derivatized SM or GlcCer was quantified using the ImageQuant TL toolbox software (GE healthcare) as a background-corrected band intensity normalized to the total clicked-lipid signal intensity (SM +Cer or GlcCer +Cer) for each lane, to correct for occasional sample-to-sample differences in click labeling efficiency. Next, the highest sample-normalized intensity of a particular time series was normalized to the maximum intensity of the time series. The error bars in the graphs represent the (relative) sample standard deviation. For each experiment, the sample size n is reported in the figure legend. ‘Technical replicates’ refers to in vitro assays performed on yeast lysates from a single batch on different days. ‘Biological replicates’ refers to assays performed on cells, which were cultured on different days from the DMSO-stocks from the same batch/passage number, then seeded and used in the experiment. To a stirred solution of aldehyde 1 (141 mg, 0.787 mmol, 1.0 equiv.) in MeOH (10 mL) was added K2CO3 (217 mg, 1.57 mmol, 2.0 equiv.) followed by dimethyl(1-diazo-2-oxopropyl)phosphonate (Müller et al., 1996) (182 mg, 0.947 mmol, 1.2 equiv.) dropwise via syringe at ambient temperature. After stirring for 2 hr, pH 7 buffer was added to the dark red mixture. The aqueous phase was extracted with EtOAc (3 × 15 mL). The combined organic fractions were washed with water (15 mL) and brine (15 mL), then dried over anhydrous magnesium sulfate, filtered and concentrated under reduced pressure. The crude material was purified by flash column chromatography (65% CH2Cl2 in hexanes) to afford alkyne 2 as a pale yellow powder (132 mg, 0.753 mmol, 95%) (McIntosh et al., 2012; MacHin and Pagenkopf, 2011). TLC (65% CH2Cl2 in hexane): Rf: 0.77. 1H NMR (CDCl3, 400 MHz, 25°C): δ 8.17 (d, J = 8.5 Hz, 2H), 7.41 (d, J = 8.5 Hz, 2H), 2.95 (t, J = 7.2 Hz, 2H), 2.55 (td, J = 7.2, 2.6 Hz, 2H), 2.01 (t, J = 2.6 Hz, 1H). 13C NMR (CDCl3, 101 MHz, 25°C): δ 148.01, 146.86, 129.53, 123.78, 82.64, 70.02, 34.52, 20.11. IR (neat, ATR): 3260, 3108, 3080, 2960, 2936, 2910, 2841, 1606, 1597, 1511, 1449, 1428, 1336, 1318, 1261, 1243, 1207, 1181, 1105, 1013, 944, 862, 848, 820, 805, 745, 697, 687, 675, 649, 631. HRMS (EI+): m/z calcd. for [C10H9NO2]+: 175.0633, found: 175.0627. Melting point: 110–111°C. To a stirred solution of 2 (132 mg, 0.753 mmol) in EtOH (25 mL) was added SnCl2.2H2O (1.70 g, 7.53 mmol, 10 equiv.). The mixture was heated to reflux and stirred for 19 hr. The reaction mixture was cooled to ambient temperature and 1M NaOH solution (50 mL) was added. The suspension was diluted with CH2Cl2 (100 mL) and filtered through a Celite plug, and the plug and precipitate were washed with CH2Cl2 (2 × 50 mL). The combined washings were separated and the organic layers were washed with brine (30 mL) and dried with anhydrous magnesium sulfate. The solution was subsequently filtered and concentrated under reduced pressure to yield alkyne 3 as a yellow oil (88.8 mg, 0.612 mmol, 82%) (Li et al., 2013). TLC (CH2Cl2): Rf: 0.35. 1H NMR (CDCl3, 400 MHz, 25°C): δ 7.03 (d, J = 7.8 Hz, 2H), 6.64 (d, J = 7.7 Hz, 2H), 3.58 (s, 2H), 2.75 (t, J = 7.4 Hz, 2H), 2.45–2.42 (m, 2H), 1.99 (d, J = 1.5 Hz, 1H). 13C NMR (CDCl3, 101 MHz, 25°C): δ 144.79, 130.51, 129.26, 115.22, 84.27, 68.82, 34.08, 20.99. IR (neat, ATR): 3433, 3359, 3286, 3017, 2926, 2858, 2113, 1708, 1622, 1515, 1429, 1274, 1180, 1125, 1084, 822, 735, 629, 566. HRMS (EI+): m/z calcd. for [C10H11N]+: 145.0892, found: 145.0882. 4-(4-Nitrosophenyl)butanoic acid was prepared by adding a solution of Oxone (510 mg, 1.67 mmol, 2.0 equiv.) in water (10 mL) to a stirring solution of 4-(4-aminophenyl)butyric acid (150 mg, 0.837 mmol, 1.0 equiv.) in CH2Cl2 (2.5 mL) at ambient temperature. The reaction mixture was stirred vigorously for 4 hr at room temperature, whereupon 2 M HCl (10 mL) was added and the aqueous layer was then extracted with CH2Cl2 (3 × 10 mL). The combined organic layers were washed with water (10 mL) and brine (10 mL), dried with anhydrous magnesium sulfate, then filtered and concentrated under reduced pressure to afford 4-(4-nitrosophenyl)butanoic acid as a yellow powder, which was taken directly to the next reaction (Priewisch and Rück-Braun, 2005). 4-(4-Nitrosophenyl)butanoic acid (110 mg, 0.569 mmol) and alkyne 3 (89 mg, 0.61 mmol) were dissolved in AcOH (6 mL) and stirred at ambient temperature for 17 hr. Reaction progress was monitored by TLC. The solvent was removed under reduced pressure, and the crude material purified by flash column chromatography (10:89:1 → 25:74:1 EtOAc/hexanes/AcOH) to afford cFAAzo-4 as a yellow gum (36 mg, 0.11 mmol, 20%). TLC (20:79:1 EtOAc/hexane/AcOH): Rf: 0.27. 1H NMR (CDCl3, 400 MHz, 25°C): δ 7.84 (dd, J = 8.0, 5.5 Hz, 4H), 7.37 (d, J = 8.2 Hz, 2H), 7.32 (d, J = 8.2 Hz, 2H), 2.92 (t, J = 7.5 Hz, 2H), 2.75 (t, J = 7.6 Hz, 2H), 2.54 (td, J = 7.4, 2.6 Hz, 2H), 2.41 (t, J = 7.3 Hz, 2H), 2.03–2.00 (m, 3H). 13C NMR (CDCl3, 101 MHz, 25°C): δ 178.48, 151.53, 151.38, 144.63, 143.66, 129.33, 129.32, 123.07, 123.01, 83.56, 69.39, 35.01, 34.79, 33.18, 26.18, 20.54. IR (neat, ATR): 3272, 2952, 2854, 1693, 1601, 1516, 1412, 1344, 1282, 1216, 1154, 911, 850. HRMS (ESI+): m/z calcd. for [C20H22N2O2]+: 321.1598, found: 321.1594 ([M + H]+). To a stirred solution of cFAAzo-4 (12.0 mg, 0.0371 mmol, 1.0 equiv.) in EtOAc (1.5 mL) was added TBTU (12.0 mg, 0.0374 mmol, 1.0 equiv.) at ambient temperature. After stirring for 1 hr, d-erythro-sphingosine (14.6 mg, 0.0487 mmol, 1.3 equiv.) was added to the solution, followed by Et3N (20.1 µL, 0.150 mmol, 4.0 equiv.). The reaction was continued for 15 hr, when progress was determined to be complete via TLC analysis. Aqueous saturated NaHCO3 solution (3 mL) was added to the reaction mixture, and the aqueous layer was separated and further extracted with EtOAc (2 × 5 mL). The combined organic layers were washed with brine (5 mL), dried over anhydrous sodium sulfate, filtered and concentrated under reduced pressure. The residue was purified by flash column chromatography (75 → 85% EtOAc in hexanes) to afford caCer-1 (14.8 mg, 0.0246 mmol, 66%) as an orange powder. TLC (80% EtOAc in hexane): Rf: 0.22. 1H NMR (CDCl3, 400 MHz, 25°C): δ 7.83 (t, J = 8.2 Hz, 4H), 7.34 (dd, J = 17.0, 8.5 Hz, 4H), 6.28 (d, J = 7.6 Hz, 1H), 5.81–5.75 (m, 1H), 5.55–5.49 (m, 1H), 4.30–4.28 (m, 1H), 3.97–3.89 (m, 2H), 3.68 (dd, J = 11.1, 3.2 Hz, 1H), 2.92 (t, J = 7.4 Hz, 2H), 2.74 (t, J = 7.5 Hz, 2H), 2.54 (td, J = 7.5, 2.6 Hz, 2H), 2.28–2.24 (m, 2H), 2.05–1.99 (m, 5H), 1.34–1.23 (m, 24H), 0.89–0.86 (m, 3H). 13C NMR (CDCl3, 101 MHz, 25°C): δ 173.32, 151.47, 151.33, 144.87, 143.67, 134.42, 129.36, 129.31, 128.83, 123.03, 123.00, 83.53, 74.79, 69.39, 62.50, 54.45, 35.89, 35.16, 34.77, 32.43, 32.06, 29.83, 29.80, 29.77, 29.63, 29.51, 29.37, 29.25, 27.00, 22.84, 20.52, 14.28. IR (neat, ATR): 3294, 2919, 2850, 1646, 1603, 1547, 1498, 1466, 1417, 1378, 1302, 1271, 1223, 1201, 1154, 1102, 1056, 1025, 1013, 961, 920, 892, 850, 832, 720, 633, 571, 560. HRMS (ESI+): m/z calcd. for [C38H56N3O3]+: 602.4316, found: 602.4316 ([M + H]+). Melting point: 103–105°C. Methyl 4-nitrosobenzoate was prepared by adding a solution of Oxone (1.50 g, 4.91 mmol, 5.0 equiv.) in water (40 mL) to a stirred solution of 4-carboxymethyl aniline (150 mg, 0.992 mmol, 1.0 equiv.) in CH2Cl2 (10 mL). The reaction mixture was stirred vigorously for 4 hr at room temperature. The reaction was quenched with 2 M HCl (50 mL) and then extracted with CH2Cl2 (3 × 50 mL). The combined organic layers were washed with water and brine, dried with anhydrous magnesium sulfate, then filtered and concentrated under reduced pressure to afford methyl 4-nitrosobenzoate as a yellow powder, which was used without further purification (Priewisch and Rück-Braun, 2005; Nishioka et al., 2007). Methyl 4-nitrosobenzoate (43 mg, 0.26 mmol, 1.5 equiv.) and alkyne 3 (25 mg, 0.17 mmol, 1.0 equiv.) were dissolved in AcOH (2 mL) and stirred at ambient temperature for 18 hr. Reaction progress was monitored by TLC. The reaction solvent was removed under reduced pressure. The crude material was then eluted through a silica gel plug (25% EtOAc in hexanes) and the solvent removed under reduced pressure to afford the product mixture as a yellow powder, which could more conveniently be purified after subsequent ester cleavage. The crude carbomethoxyaryl mixture was dissolved in MeOH (2 mL) and 2 M NaOH (0.4 mL) was added. The reaction was stirred for 16 hr at ambient temperature and was then acidified by the addition of 1 M HCl solution (1 mL). The mixture was extracted with EtOAc, then washed with water and brine. The organic layer was dried with anhydrous magnesium sulfate, then filtered and concentrated under reduced pressure and the crude material was purified by flash column chromatography (silica gel, 10:89:1 → 25:74:1 EtOAc/hexane/AcOH) to afford cFAAzo-1 as a pale-yellow powder (16 mg, 0.057 mmol, 34% over two steps). TLC (25:74:1 EtOAc/hexane/AcOH): Rf: 0.30. 1H NMR (acetone-d6, 400 MHz, 25°C): δ 8.26 (d, J = 8.6 Hz, 2H), 8.02 (d, J = 8.6 Hz, 2H), 7.95 (d, J = 8.4 Hz, 2H), 7.55 (d, J = 8.5 Hz, 2H), 2.97 (t, J = 7.3 Hz, 2H), 2.59 (td, J = 7.4, 2.7 Hz, 2H), 2.41 (t, J = 2.7 Hz, 1H). 13C NMR (acetone-d6, 101 MHz, 25°C): δ 166.98, 155.97, 152.06, 146.21, 133.23, 131.65, 130.46, 123.88, 123.35, 83.99, 70.79, 35.26, 20.62. IR (neat, ATR): 3281, 2931, 2362, 1686, 1603, 1544, 1503, 1427, 1310, 1292, 1142, 1098, 1012, 946, 867, 835, 778, 692. HRMS (EI+): m/z calcd. for [C17H14N2O2]+: 278.1055, found: 278.1047. Melting point: 235°C (decomposed). To a stirred solution of cFAAzo-1 (4.2 mg, 0.015 mmol, 1.0 equiv.) in EtOAc/DMF (5:1, 0.6 mL) was added HBTU (5.7 mg, 0.015 mmol,1.0 equiv.) under an inert atmosphere at ambient temperature. After 1 hr, d-erythro-sphingosine (5.4 mg, 0.018 mmol, 1.2 equiv.) was added, followed by Et3N (6.3 µL, 0.045 mmol, 3.0 equiv.). The reaction was continued for 6.5 hr, when progress was determined to be complete via TLC. The reaction was quenched by the addition of saturated NaHCO3 solution (5 mL). The mixture was extracted with EtOAc (3 × 5 mL), and the combined organic layers were washed with brine (5 mL), dried with anhydrous sodium sulfate, filtered and concentrated under reduced pressure. The crude product was purified by flash column chromatography (60 → 75% EtOAc in pentane) to afford caCer-2 as an orange powder (7.0 mg, 0.013 mmol, 83%). TLC (75% EtOAc in hexane): Rf: 0.43. 1H NMR (CDCl3, 400 MHz, 25°C): δ 7.92 (d, J = 1.0 Hz, 4H), 7.88 (d, J = 8.4 Hz, 2H), 7.38 (d, J = 8.4 Hz, 2H), 7.12 (d, J = 7.6 Hz, 1H), 5.87–5.80 (m, 1H), 5.60 (dd, J = 15.4, 6.3 Hz, 1H), 4.47 (t, J = 4.7 Hz, 1H), 4.14–4.07 (m, 2H), 3.83 (dd, J = 11.2, 3.1 Hz, 1H), 2.93 (d, J = 14.8 Hz, 2H), 2.54 (td, J = 7.4, 2.6 Hz, 2H), 2.06 (dt, J = 11.0, 5.3 Hz, 2H), 2.01 (t, J = 4.1 Hz, 1H), 1.37–1.34 (m, 2H), 1.23 (s, 22H), 0.87 (t, J = 6.9 Hz, 3H). 13C NMR (CDCl3, 101 MHz, 25°C): δ 167.19, 154.59, 151.39, 144.62, 135.85, 134.71, 129.45, 128.88, 128.21, 123.39, 123.03, 83.43, 75.02, 69.48, 62.52, 54.88, 34.81, 32.46, 32.08, 29.85, 29.84, 29.81, 29.76, 29.64, 29.52, 29.36, 29.27, 22.85, 20.47, 14.29. IR (neat, ATR): 3295, 2921, 2851, 1637, 1541, 1493, 1467, 1341, 1297, 1055, 1014, 964, 858. HRMS (ESI+): m/z calcd. for [C35H50N3O3]+: 560.3847, found: 560.3851 ([M + H]+). Melting point: 120°C. A solution of 1-nonyne (0.500 g, 4.03 mmol, 1.0 equiv.) in THF (30 mL) and HMPA (8 mL) was cooled to –78°C and treated with a solution of n-BuLi (2.48 M in hexanes, 3.41 mL, 8.45 mmol, 2.1 equiv.). The opaque, black solution was warmed to 0°C and stirred for 1 hr, then cooled once more to –78°C whereupon 6-bromohexanoic acid (0.785 g, 4.03 mmol, 1.0 equiv.) in THF (6 mL) was added dropwise. The reaction mixture was allowed to warm to ambient temperature and stirred for 48 hr, where the solution became clear and pale brown. Saturated aqueous ammonium chloride solution (25 mL) was then added to the solution and the aqueous layer was separated and extracted with EtOAc (3 × 30 mL). The combined organic layers were washed with distilled water (2 × 20 mL), saturated aqueous lithium chloride solution (2 × 20 mL) and brine (20 mL), dried over anhydrous sodium sulfate, filtered and concentrated. The pale orange oil was used directly in the next procedure without purification. The crude oil from the previous step was dissolved in THF (5 mL) and was added dropwise to a suspension of lithium aluminum hydride (229 mg, 6.05 mmol, 1.5 equiv.) cooled to 0°C with an ice bath. The mixture was allowed to warm to room temperature and stirred for 1.5 hr, where thin layer chromatography analysis indicated complete conversion. The mixture was cooled with an ice bath and carefully quenched with distilled water (5 mL) followed by 2 M aqueous sodium hydroxide solution (10 mL). The aqueous phase was extracted with Et2O (3 × 30 mL) and the combined organic layers were washed with saturated aqueous ammonium chloride (30 mL) and brine (20 mL), dried over anhydrous sodium sulfate, filtered and concentrated under reduced pressure. The crude oil was purified by flash column chromatography (15% EtOAc in pentane) to yield pentadec-7-yn-1-ol S1 (127 mg, 0.567 mmol, 14% over two steps) as a colorless oil. TLC (30% EtOAc in pentane): Rf=0.62. 1H NMR (CDCl3, 400 MHz, 25°C): δ 3.64 (t, J = 6.6 Hz, 2H), 2.19–2.08 (m, 4H), 1.58 (p, J = 6.7 Hz, 2H), 1.53–1.18 (m, 17H), 0.88 (t, J = 6.8 Hz, 3H). 13C NMR (CDCl3, 100 MHz, 25°C): δ 80.55, 80.16, 63.14, 32.83, 31.93, 29.31, 29.21, 28.99, 28.99, 28.74, 25.43, 22.79, 18.90, 18.84, 14.26. IR (neat, ATR): 3328, 2927, 2856, 1460, 1434, 1378, 1332, 1073, 1054, 1030, 724. MS (FAB+): m/z calcd. for [C16H17N2O]+: 225.4, found: 225.4 ([M + H]+). Sodium hydride (60% in mineral oil, 149 mg, 3.74 mmol, 8.0 equiv.) was added in one portion to 1,3-diaminopropane (5 mL) at room temperature. The mixture was heated to 70°C and stirred for 1 hr, where it became opaque and brown, then cooled to room temperature. Pentadec-7-yn-1-ol S1 (105 mg, 0.467 mg, 1.0 equiv.) in 1,3-diaminopropane (2 mL) was added to the vessel and the mixture was heated to 60°C and stirred for 19 hr. The reaction mixture was allowed to cool to room temperature and diluted with Et2O (10 mL). Distilled water (10 mL) was then carefully added and the aqueous layer was separated and further extracted with Et2O (3 × 10 mL). The combined organic layers were washed with distilled water (10 mL), 1 M HCl (10 mL) and brine (10 mL), dried over anhydrous sodium sulfate, filtered and concentrated. The crude residue was purified by flash column chromatography (15% EtOAc in pentane) to yield pentadec-14-yn-1-ol S2 (70.3 mg, 0.313 mmol, 67%) as a white solid. The 1H NMR spectrum is in agreement with that previously reported (Oppolzer et al., 2001). TLC (20% EtOAc in pentane): Rf=0.44. 1H NMR (CDCl3, 400 MHz, 25°C): δ 3.61 (t, J = 6.7 Hz, 2H), 2.16 (td, J = 7.1, 2.7 Hz, 2H), 1.92 (t, J = 2.7 Hz, 1H), 1.59–1.46 (m, 5H), 1.40–1.22 (m, 18H). A chromic acid oxidizing solution was prepared according to literature (Eisenbraun, 1965). Chromium trioxide (67.0 g, 670 mmol) was dissolved in distilled water (125 mL) and the solution was cooled to 0°C. Concentrated sulfuric acid (58 mL) was added to the solution and the mixture was allowed to warm to room temperature. Distilled water was added to bring the total volume of the solution to 225 mL, making a ~ 3 M aqueous solution of chromic acid oxidizing solution. The chromic acid solution (0.149 mL, 0.446 mmol, 1.5 eq.) was added dropwise to a solution of pentadec-14-yn-1-ol S2 (66.7 mg, 0.297 mmol, 1.0 equiv.) in acetone (2.0 mL) at 0°C. The mixture was stirred for 2 hr at 0°C until TLC analysis indicated complete conversion. The solution was filtered through a pad of Celite and the vessel and pad were washed with Et2O (50 mL). The filtrate was washed with distilled water (20 mL) and brine (20 mL) and concentrated under reduced pressure. The crude residue was purified by flash column chromatography (10 → 30% EtOAc in pentane) to yield pentadec-14-ynoic acid 4 (58.1 mg, 0.244 mmol, 82%) as a waxy white solid. The 1H NMR spectrum is in agreement with that previously reported (Seike et al., 2006). TLC (20% EtOAc in pentane): Rf=0.24. 1H NMR (CDCl3, 400 MHz, 25°C): δ 11.24 (broad s, 1H), 2.34 (t, J = 7.5 Hz, 2H), 2.18 (td, J = 7.1, 2.7 Hz, 2H), 1.94 (t, J = 2.6 Hz, 1H), 1.62 (q, J = 7.2 Hz, 2H), 1.52 (p, J = 7.2 Hz, 2H), 1.43–1.19 (m, 16H). A solution of 4-propylaniline (2.50 g, 18.5 mmol, 2.1 equiv.) in CH2Cl2 (80 mL) was treated with Oxone (22.7 g, 74.0 mmol, 8.5 equiv.) in distilled water (100 mL) at room temperature and the biphasic mixture was stirred vigorously at room temperature for 20 hr. The aqueous phase was separated and further extracted with CH2Cl2 (2 × 60 mL). The combined organic phases were washed with 1 M hydrochloric acid solution (75 mL), saturated aqueous sodium bicarbonate solution (75 mL) and brine (75 mL), then dried over anhydrous sodium sulfate, filtered and concentrated under reduced pressure. The crude residue was purified by flash column chromatography (CH2Cl2), and the bright green fractions were collected, combined and concentrated to afford 4-propylnitrosobenzene as a clear green oil, which was taken directly to the next procedure. The nitrosobenzene was redissolved in glacial acetic acid (75 mL) and 4-aminobenzyl alcohol (1.08 g, 8.74 mmol, 1.0 equiv.) in acetic acid (25 mL) was added to the solution at room temperature. The mixture was stirred vigorously for 72 hr at room temperature, then concentrated under reduced pressure and azeotroped twice with toluene (50 mL). The crude orange solid was purified by flash column chromatography (20 → 25% EtOAc in pentane) to afford 4-((4-propylphenyl)diazenyl)benzyl alcohol 5 (911 mg, 3.58 mmol, 41% yield) as an orange solid. TLC (30% EtOAc in pentane): Rf=0.43. 1H NMR (CDCl3, 400 MHz, 25°C): δ 7.90 (d, J = 8.4 Hz, 2H), 7.85 (d, J = 8.4 Hz, 2H), 7.50 (d, J = 8.4 Hz, 2H), 7.32 (d, J = 8.4 Hz, 2H), 4.77 (s, 2H), 2.67 (t, J = 7.5 Hz, 2H), 1.89 (broad s, 1H), 1.70 (p, J = 7.5 Hz, 2H), 0.97 (t, J = 7.5 Hz, 3H).13C NMR (CDCl3, 100 MHz, 25°C): δ 152.32, 151.05, 146.49, 143.62, 129.31, 127.56, 123.07, 122.96, 65.03, 38.08, 24.55, 13.94. IR (neat, ATR): 3332, 2958, 2930, 2869, 1661, 1585, 1499, 1449, 1417, 1340, 1303, 1222, 1026, 1010, 852, 832. HRMS (ESI+): m/z calcd. for [C16H19N2O]+: 255.1492, found: 255.1491 ([M + H]+). Melting point: 138°C. A solution of 4-((4-propylphenyl)diazenyl)benzyl alcohol 5 (302 mg, 1.19 mmol, 1.0 equiv.) in CH2Cl2 (12 mL) was treated with Dess-Martin periodinane (655 mg, 1.55 mmol, 1.3 equiv.) at room temperature. The reaction mixture was left to stir for 45 min and a mixture of saturated aqueous sodium bicarbonate solution and saturated aqueous sodium thiosulfate solution (1:1, 20 mL) was then added. The biphasic mixture was stirred for 30 min, then the aqueous phase was separated and extracted with CH2Cl2 (2 × 20 mL). The combined organic layers were washed with saturated aqueous sodium bicarbonate solution (30 mL), dried over anhydrous sodium sulfate, filtered and concentrated under reduced pressure. The crude residue was purified by flash column chromatography (3 → 4% EtOAc in pentane) to afford 4-((4-propylphenyl)diazenyl)benzaldehyde 6 (282 mg, 1.12 mmol, 94%) as a red crystalline solid. TLC (30% EtOAc in pentane): Rf=0.43. 1H NMR (CDCl3, 400 MHz, 25°C): δ 10.07 (s, 1H), 8.00 (s, 4H), 7.88 (d, J = 8.1 Hz, 2H), 7.32 (d, J = 8.1 Hz, 2H), 2.66 (t, J = 7.6 Hz, 2H), 1.69 (p, J = 7.5 Hz, 2H), 0.97 (t, J = 7.4 Hz, 3H).13C NMR (CDCl3, 100 MHz, 25°C): δ 191.64, 156.01, 150.91, 147.57, 137.24, 130.70, 129.34, 123.36, 123.25, 38.04, 24.40, 13.88. IR (neat, ATR): 3023, 2956, 2929, 2845, 2739, 1696, 1597, 1581, 1498, 1460, 1416, 1378, 1316, 1304, 1289, 1197, 1183, 1148, 1129, 1112, 1090, 1003, 908, 847, 831, 811, 793, 75, 729, 663. HRMS (ESI+): m/z calcd. for [C16H19N2O]+: 253.1335, found: 253.1336 ([M + H]+). Melting point: 107°C. A suspension of methyltriphenylphosphonium bromide (439 mg, 1.23 mmol, 1.1 equiv.) in THF (12 mL) at 0°C was treated with a solution of n-BuLi (2.48 m in hexanes, 0.496 mL, 1.23 mmol, 1.1 equiv.). The resulting bright yellow suspension was stirred for 20 min at 0°C and a solution of 4-((4-propylphenyl)diazenyl)benzaldehyde 6 (282 mg, 1.12 mmol, 1.0 equiv.) in THF (5 mL) was added dropwise. The mixture was allowed to warm to room temperature and stirred for 1 hr. Saturated aqueous ammonium chloride solution (20 mL) was added and the aqueous phase was extracted with CH2Cl2 (3 × 20 mL). The combined organic layers were dried over anhydrous sodium sulfate, filtered and concentrated under reduced pressure. The residue was purified by flash column chromatography (dry loading with 1 g silica gel, 0 → 3% Et2O in pentane) to yield 1-(4-propylphenyl)−2-(4-vinylphenyl)diazene 7 (237 mg, 0.946 mmol, 84%) as a crystalline orange solid. TLC (30% EtOAc in pentane): Rf=0.43. 1H NMR (CDCl3, 400 MHz, 25°C): δ 7.89 (d, J = 8.5 Hz, 2H), 7.86 (d, J = 8.4 Hz, 2H), 7.55 (d, J = 8.5 Hz, 2H), 7.33 (d, J = 8.4 Hz, 2H), 6.79 (dd, J = 17.6, 10.9 Hz, 1H), 5.87 (d, J = 17.6 Hz, 1H), 5.36 (d, J = 10.9 Hz, 1H), 2.68 (t, J = 7.5 Hz, 2H), 1.70 (h, J = 7.5 Hz, 2H), 0.98 (t, J = 7.5 Hz, 3H). 13C NMR (CDCl3, 100 MHz, 25°C): δ 152.31, 151.17, 146.42, 140.00, 136.33, 129.30, 127.03, 123.21, 122.96, 115.55, 38.09, 24.56, 13.95. IR (neat, ATR): 3045, 2958, 2929, 2870, 1626, 1598, 1497, 1454, 1414, 1402, 1303, 1287, 1226, 1155, 1109, 1011, 988, 908, 848, 802, 748. HRMS (ESI+): m/z calcd. for [C17H19N2]+: 251.1543, found: 251.1543 ([M + H]+). Melting point: 37°C. 4-Iodo-4’-methylazobenzene was synthesized following a modified procedure of Strueben et al. (2014). A solution of p-toluidine (2.50 g, 24.3 mmol, 1.0 equiv.) in CH2Cl2 (80 mL) was treated with Oxone (29.8 g, 97.1 mmol, 4.1 equiv.) in distilled water (120 mL) at room temperature and the biphasic mixture was stirred vigorously at room temperature for 18 hr. The aqueous phase was separated and further extracted with CH2Cl2 (2 × 50 mL). The combined organic phases washed with 1 M hydrochloric acid solution (80 mL), saturated aqueous sodium bicarbonate solution (80 mL) and brine (80 mL), then dried over anhydrous sodium sulfate, filtered and concentrated under reduced pressure. The crude residue was purified by flash column chromatography (CH2Cl2), and the bright green fractions were collected, combined and concentrated to afford a clear green oil. The oil was redissolved in CH2Cl2 (20 mL) and acetic acid (30 mL) and 4-iodoaniline (5.13 g, 23.4 mmol, 1.0 equiv.) was added to the solution. The mixture was stirred for 15 hr at room temperature, during which an orange-yellow crystalline solid precipitated. The mixture was concentrated under reduced pressure, suspended in ice-cold ethanol (30 mL) and filtered. The recovered crystals were washed with ice-cold ethanol (30 mL) and dried to afford 4-iodo-4’-methylazobenzene S3 (3.35 g, 10.4 mmol, 45% yield) as an orange-yellow crystalline solid. The 1H NMR and 13C NMR spectra are in agreement with those previously reported (Strueben et al., 2014). 1H NMR (CDCl3, 400 MHz, 25°C): δ 7.85 (d, J = 8.5 Hz, 2H), 7.82 (d, J = 8.5 Hz, 2H), 7.64 (d, J = 8.5 Hz, 2H), 7.32 (d, J = 8.5 Hz, 3H), 2.44 (s, 3H). 13C NMR (CDCl3, 100 MHz, 25°C): δ 152.13, 150.70, 142.17, 138.43, 129.96, 124.51, 123.12, 97.37, 21.72. 1-(4-Iodophenyl)−2-(p-tolyl)diazene (3.34 g, 10.4 mmol, 1.0 equiv.) was suspended in DMF (12 mL) and toluene (12 mL) at room temperature and tetrabutylammonium chloride (2.89 g, 10.4 mmol, 1.0 equiv. ), sodium bicarbonate (2.18 g, 26.0 mmol, 2.5 equiv.) and allyl alcohol (0.906 g, 15.6 mmol, 1.5 equiv.) were added sequentially to the stirring mixture. The orange suspension was stirred for 10 min at room temperature, whereupon PdCl2 (0.369 mg, 2.08 mmol, 0.20 equiv.) was added to the flask. The bright red suspension was warmed to 45°C and stirred for 2.5 hr, then cooled back to room temperature and stirred for 48 hr. The reaction mixture was then diluted with EtOAc (125 mL) and washed successively with 1 M aqueous hydrochloric acid solution (50 mL), distilled water (4 × 50 mL) and brine (50 mL). The organic layer was dried over anhydrous sodium sulfate, filtered and concentrated. The crude residue was purified by flash column chromatography (6 → 10% EtOAc in pentane) to yield 3-(4-(p-tolyldiazenyl)phenyl)propanal (2.28 g, 9.07 mmol, 87%) as a crystalline orange solid. TLC (10% EtOAc in pentane): Rf=0.36. 1H NMR (CDCl3, 400 MHz, 25°C): δ 9.82 (s, 1H), 7.85 (d, J = 7.5 Hz, 2H), 7.83 (d, J = 7.5 Hz, 2H), 7.33 (d, J = 7.5 Hz, 2H), 7.31 (d, J = 7.5 Hz, 2H), 3.02 (t, J = 7.5 Hz, 2H), 2.81 (t, J = 7.5 Hz, 2H), 2.43 (s, 3H). 13C NMR (CDCl3, 100 MHz, 25°C): δ 201.18, 151.36, 150.78, 143.48, 141.52, 129.80, 129.06, 123.06, 122.85, 45.08, 27.97, 21.57. IR (neat, ATR): 3022, 2921, 2832, 2730, 1716, 1600, 1497, 1448, 1416, 1390, 1356, 1302, 1221, 1210, 1153, 1111, 1061, 1038, 1011, 904, 843, 822, 728, 705, 682. HRMS (ESI+): m/z calcd. for [C16H17N2O]+: 253.1335, found: 253.1336 ([M + H]+). Melting point: 78°C. A suspension of methyltriphenylphosphonium bromide (3.87 g, 10.8 mmol, 1.2 equiv.) in THF (50 mL) at –78°C was treated with a solution of n-BuLi (2.48 m in hexanes, 4.37 mL, 10.8 mmol, 1.2 equiv.). The resulting bright yellow suspension was warmed to 0°C for 20 min, then cooled once more to –78°C. 3-(4-(p-Tolyldiazenyl)phenyl)propanal (2.28 g, 9.02 mmol, 1.0 equiv.) in THF (10 mL) was added dropwise and the mixture was allowed to warm to room temperature and stirred for 15 hr. Saturated aqueous ammonium chloride solution (60 mL) was added and the aqueous phase was separated and further extracted with CH2Cl2 (2 × 80 mL). The combined organic layers were dried over anhydrous sodium sulfate, filtered and concentrated under reduced pressure. The residue was purified by flash column chromatography (dry loading, 1 → 2% EtOAc in pentane) to yield 1-(4-(but-3-en-1-yl)phenyl)−2-(p-tolyl)diazene (2.06 g, 8.22 mmol, 91%) as a crystalline orange solid. TLC (2% EtOAc in pentane): Rf=0.30. 1H NMR (CDCl3, 400 MHz, 25°C): δ 7.78 (d, J = 8.2 Hz, 2H), 7.76 (d, J = 7.5 Hz, 2H), 7.25 (d, J = 8.2 Hz, 2H), 7.23 (d, J = 7.5 Hz, 2H), 5.80 (ddt, J = 16.9, 10.2, 6.6 Hz, 1H), 4.99 (dd, J = 16.9, 1.7 Hz, 1H), 4.94 (dd, J = 10.2, 1.7 Hz, 1H), 2.72 (t, J = 7.5 Hz, 2H), 2.36 (m, 5H). 13C NMR (CDCl3, 100 MHz, 25°C): δ 151.20, 150.92, 145.14, 141.35, 137.80, 129.82, 129.23, 122.88, 122.86, 115.38, 35.42, 35.37, 21.61. IR (neat, ATR): 3074, 3054, 3024, 2977, 2922, 2857, 1640, 1601, 1580, 1497, 1440, 1415, 1302, 1224, 1209, 1155, 1105, 1012, 996, 950, 907, 837, 823, 708, 643. HRMS (ESI+): m/z calcd. for [C17H19N2]+: 251.1543, found: 251.1542 ([M + H]+). Melting point: 57°C. Vinyl magnesium bromide (1.0 M in THF, 22.7 mL, 22.7 mmol, 2.0 equiv.) was added over 30 min via drop funnel to a solution of (S)−1,1-dimethylethyl 4-formyl-2,2-dimethyloxazolidine-3-carboxylate (2.61 g, 11.4 mmol, 1.0 equiv.) in THF (50 mL) at –78°C. The reaction mixture was stirred for 2 hr at –78°C until TLC analysis indicated complete conversion, and saturated aqueous ammonium chloride solution (40 mL) was added at this temperature. After warming to room temperature, the aqueous layer was separated and extracted with EtOAc (3 × 70 mL). The combined organic layers were dried over anhydrous sodium sulfate, filtered and concentrated. The crude residue was purified by flash column chromatography (15% EtOAc in pentane) to afford N-Boc-(R)−1-((S)−2,2-dimethyloxazolidin-4-yl)prop-2-en-1-ol 8 (2.33 g, 9.07 mmol, 80%) as a colorless oil. High-temperature 1H NMR analysis indicates a 5.2:1 anti/syn mixture of diastereomers, consistent with previous literature results (Ojima and Vidal, 1998). Further purification of the mixture by careful column chromatography (10% EtOAc in pentane) yielded the pure anti diastereomer. TLC (20% EtOAc in pentane): Rf=0.35. 1H NMR (toluene-d8, 400 MHz, 90°C): δ 5.81 (ddd, J = 16.7, 10.5, 5.2 Hz, 1H), 5.31 (dt, J = 16.7, 1.8 Hz, 1H), 5.06 (d, J = 10.5 Hz, 1H), 4.26 (broad s, 1H), 3.87 (m, 1H), 3.77 (m, 1H), 3.66 (dd, J = 9.0, 6.8 Hz, 1H), 1.58 (s, 3H), 1.43 (s, 3H), 1.38 (s, 9H). 13C NMR (toluene-d8, 100 MHz, 90°C): δ 153.39, 138.68, 115.44, 94.68, 80.27, 73.87, 64.81, 62.47, 28.49, 26.82, 24.43. IR (neat, ATR): 3461, 2978, 2936, 2879, 1694, 1478, 1456, 1377, 1365, 1255, 1206, 1170, 1095, 1049, 989, 923, 848, 807, 767. HRMS (ESI+): m/z calcd. for [C13H24NO4]+: 258.1700, found: 258.1699 ([M + H]+). Hoyveda-Grubbs 2nd generation catalyst (29.6 mg, 0.0472 mmol, 0.10 equiv.) was added to a solution of allyl alcohol 8 (121 mg, 0.472 mmol, 1.0 equiv.) and olefin 7 (236 mg, 0.944 mmol, 2.0 equiv.) in degassed CH2Cl2 (6 mL) at room temperature. The deep red mixture was heated to 45°C and stirred for 21 hr. The mixture was cooled to room temperature and, without concentrating, was loaded on an equilibrated silica gel column and purified by flash column chromatography (15% to 25% EtOAc in pentane). The combined fractions contained traces of remnant catalyst, and the product was purified a second time by flash column chromatography (15 → 25% EtOAc in pentane) to yield 9 (71.1 mg, 0.148 mmol, 31%) as a dark orange gum. TLC (20% EtOAc in pentane): Rf=0.32. 1H NMR (toluene-d8, 400 MHz, 90°C): δ 7.90 (d, J = 8.3 Hz, 2H), 7.88 (d, J = 8.3 Hz, 2H), 7.35 (d, J = 8.4 Hz, 2H), 7.07 (d, J = 8.3 Hz, 2H), 6.68 (dd, J = 15.8, 1.5 Hz, 1H), 6.26 (dd, J = 15.8, 5.6 Hz, 1H), 4.37 (m, 1H), 3.98 (m, 1H), 3.81 (m, 1H), 3.70 (dd, J = 9.1, 6.7 Hz, 1H), 2.43 (t, J = 7.3, 2H), 1.56 (s, 3H), 1.52 (q, J = 7.3, 2H), 1.41 (s, 3H), 1.32 (s, 9H), 0.84 (t, J = 7.3 Hz, 3H). 13C NMR (toluene-d8, 100 MHz, 90°C): δ 153.79, 152.91, 152.14, 146.11, 140.24, 131.86, 130.52, 129.35, 127.55, 123.72, 123.49, 94.78, 80.53, 74.33, 65.21, 62.93, 38.27, 28.46, 27.02, 24.51, 13.81. IR (neat, ATR): 3426, 2976, 2933, 2873, 1693, 1600, 1497. 1477, 1455, 1389, 1376, 1366, 1255, 1205, 1156, 1100, 1068, 1050, 967, 921, 864, 847, 768, 733. HRMS (ESI+): m/z calcd. for [C28H38N3O4]+: 480.2857, found: 480.2860 ([M + H]+). (R,E)−1-((S)−2,2-dimethyloxazolidin-4-yl)−6-(4-(p-tolyldiazenyl)phenyl)hex-2-en-1-ol 9 (23.9 mg, 0.0498 mmol, 1.0 equiv.) was dissolved in THF (1.25 mL) and the solution was cooled to 0°C with an ice bath. 2 M hydrochloric acid (0.50 mL) was added dropwise and the reaction mixture was heated to 60°C. After stirring for 3 hr, the solution was cooled to ambient temperature and saturated sodium carbonate solution (5 mL) was added. The aqueous phase was extracted with CH2Cl2 (3 × 10 mL) and the combined organic layers were dried over anhydrous sodium sulfate, filtered and concentrated under reduced pressure. The crude orange solid was purified by flash column chromatography (5/94.5/0.5 → 10/89/1 MeOH/CH2Cl2/aqueous ammonium hydroxide solution) to afford aSph-1 (13.1 mg, 0.0386 mmol, 77%) as an orange solid. TLC (40% acetone in toluene): Rf=0.14. 1H NMR (methanol-d4, 400 MHz, 25°C): δ 7.77 (d, J = 8.6 Hz, 2H), 7.73 (d, J = 8.4 Hz, 2H), 7.53 (d, J = 8.6 Hz, 2H), 7.26 (d, J = 8.4 Hz, 2H), 6.66 (d, J = 15.9 Hz, 1H), 6.38 (dd, J = 15.9, 6.8 Hz, 1H), 4.19 (t, J = 5.8 Hz, 1H), 3.65 (dd, J = 10.9, 4.6 Hz, 1H), 3.48 (dd, J = 10.9, 6.9 Hz, 1H), 2.85 (q, J = 5.7 Hz, 1H), 2.58 (d, J = 7.5 Hz, 2H), 1.60 (h, J = 7.4 Hz, 2H), 0.88 (t, J = 7.4 Hz, 3H).13C NMR (methanol-d4, 100 MHz, 25°C): δ 153.28, 152.36, 147.76, 141.00, 132.46, 132.26, 130.31, 128.38, 124.10, 123.82, 74.80, 64.24, 58.28, 38.89, 25.61, 14.10. IR (neat, ATR): 3045, 2958, 2929, 2870, 1626, 1598, 1497, 1454, 1414, 1402, 1303, 1287, 1226, 1155, 1109, 1011, 988, 908, 848, 802, 748. HRMS (ESI+): m/z calcd. for [C20H26N3O2]+: 340.2020, found: 340.2020 ([M + H]+). Melting point: 135°C. aSph-1 (7.9 mg, 0.023 mmol, 1.0 equiv.) and pentadec-14-ynoic acid 4 (6.1 mg, 0.026 mmol, 1.1 equiv.) were dissolved in CH2Cl2 (0.8 mL) and the solution was cooled to 0°C with an ice bath. Diisopropylethylamine (12.2 µL, 0.0698 mmol, 3.0 equiv. ), 1-ethyl-3-(3-dimethylaminopropyl)carbodiimide hydrochloride (7.6 mg, 0.040 mmol, 1.7 equiv.) and 1-hydroxybenzotriazole hydrate (6.8 mg, 0.044 mmol, 1.9 equiv.) were added sequentially to the flask, and the mixture was allowed warm to room temperature and was stirred for 20 hr. Saturated aqueous sodium bicarbonate solution (5 mL) was then added to the mixture. The aqueous layer was separated and extracted with CH2Cl2 (3 × 5 mL). The combined organic layers were washed with 1 M hydrochloric acid (5 mL) and brine (5 mL), dried over anhydrous sodium sulfate, filtered and concentrated under reduced pressure. The residue was purified by flash column chromatography (2 → 4% MeOH in CH2Cl2) to afford caCer-3 (11.0 mg, 0.0197 mmol, 85%) as an orange solid. Due to initially proceeding with a mixture of epimers from compound 8, our first synthesis of caCer-3 produced an inseparable 7.3:1 mixture of erythro/threo ceramide by 1H NMR analysis and biological assays were conducted with this mixture. The procedures reported here are from a second synthesis conducted with anti-8 to yield pure erythro-caCer-3. TLC (90% EtOAc in pentane): Rf=0.36. 1H NMR (CDCl3, 400 MHz, 25°C): δ 7.86 (d, J = 8.5 Hz, 2H), 7.83 (d, J = 8.3 Hz, 2H), 7.50 (d, J = 8.5 Hz, 2H), 7.31 (d, J = 8.3 Hz, 2H), 6.77 (d, J = 16.1 Hz, 1H), 6.38 (dd, J = 16.1, 5.7 Hz, 1H), 6.37 (s, 1H), 4.59 (t, J = 4.0 Hz, 1H), 4.05 (m, 2H), 3.78 (m, 1H), 2.66 (t, J = 7.5 Hz, 2H), 2.24 (m, 2H), 2.16 (td, J = 7.1, 2.6 Hz, 2H), 1.94 (t, J = 2.6 Hz, 1H), 1.66 (m, 4H), 1.50 (p, J = 7.3 Hz, 2H) 1.41–1.15 (m, 18H), 0.97 (t, J = 7.3 Hz, 3H). 13C NMR (CDCl3, 100 MHz, 25°C): δ 174.30, 152.30, 151.11, 146.52, 138.71, 131.21, 130.19, 129.31, 127.38, 123.33, 122.99, 84.99, 74.62, 68.19, 62.52, 54.62, 38.09, 36.99, 29.74, 29.71, 29.64, 29.61, 29.52, 29.43, 29.25, 28.90, 28.62, 25.94, 24.55, 18.54, 13.95. IR (neat, ATR): 3296, 2922, 2850, 1645, 1600, 1547, 1467, 1440, 1302, 1257, 1155, 1116, 1065, 1002, 964, 862, 825, 724, 696. HRMS (ESI+): m/z calcd. for [C35H50N3O3]+: 560.3847, found: 560.3862 ([M + H]+). Melting point: 133°C. Hoyveda-Grubbs catalyst, 2nd generation (63.8 mg, 0.102 mmol, 0.10 equiv.) was added to a solution of allyl alcohol S5 (262 mg, 1.02 mmol, 1.0 equiv.) and 1-(4-(but-3-en-1-yl)phenyl)−2-(p-tolyl)diazene (510 mg, 2.04 mmol, 2.0 equiv.) in degassed CH2Cl2 (8 mL) at room temperature. The deep red mixture was heated to 45°C and stirred for 16 hr. The mixture was cooled to ambient temperature and, without concentrating, was loaded on an equilibrated silica gel column and purified by flash column chromatography (15 → 25% EtOAc in pentane). The combined fractions contained traces of remnant catalyst, and the product was purified a second time by flash column chromatography (15 → 25% EtOAc in pentane) to yield S6 (223 mg, 0.450 mmol, 44%) as an orange gum. TLC (20% EtOAc in pentane): Rf=0.35. 1H NMR (toluene-d8, 400 MHz, 90°C): δ 7.89 (d, J = 8.1 Hz, 2H), 7.86 (d, J = 8.1 Hz, 2H), 7.08 (m, 4H), 5.72 (dt, J = 13.3, 6.5 Hz, 1H), 5.49 (dd, J = 15.4, 5.6 Hz, 1H), 4.26 (broad s, 1H), 3.87 (m, 1H), 3.77 (m, 1H), 3.66 (dd, J = 9.0, 6.8 Hz, 1H), 2.62 (t, J = 7.7 Hz, 2H), 2.30 (q, J = 7.3 Hz, 2H), 2.15 (s, 3H), 1.58 (s, 3H), 1.43 (s, 3H), 1.38 (s, 9H). 13C NMR (toluene-d8, 100 MHz, 90°C): 129.94, 129.37, 123.45, 123.38, 94.71, 80.24, 73.64, 64.92, 62.81, 35.99, 34.20, 28.60, 26.94, 24.55, 21.22. IR (neat, ATR): 3448, 2978, 2933, 1694, 1602, 1498, 1478, 1454, 1388, 1376, 1365, 1255, 1206, 1156, 1101, 1067, 1014, 968, 912, 842, 768, 733. HRMS (ESI+): m/z calcd. for [C28H38N3O4]+: 480.2857, found: 480.2873 ([M + H]+). 2 M Hydrochloric acid solution (2 mL) was added dropwise to a solution of S6 (94.2 mg, 0.196 mmol, 1.0 equiv.) in THF (4 mL) at room temperature and the reaction mixture was heated to 60°C for 3 hr. The solution was then basified to pH 10 with 2 M sodium hydroxide solution (2.4 mL) and the aqueous mixture was extracted with CH2Cl2 (3 × 10 mL). The combined organic layers were washed with brine (10 mL), dried over anhydrous sodium sulfate, filtered and concentrated under reduced pressure. The crude orange solid was purified by flash column chromatography (5/94.5/0.5 → 10/89/1 MeOH/CH2Cl2/aqueous 25% ammonium hydroxide solution) to afford aSph-2 (55.5 mg, 0.164 mmol, 84%) as an orange solid. TLC (40% acetone in toluene): Rf=0.14. 1H NMR (methanol-d4, 400 MHz, 25°C): δ 7.79 (d, J = 8.1 Hz, 2H), 7.76 (d, J = 7.9 Hz, 2H), 7.34 (d, J = 8.1 Hz, 2H), 7.31 (d, J = 7.9 Hz, 2H), 5.76 (dt, J = 15.4, 6.8 Hz, 1H), 5.47 (dd, J = 15.4, 6.8 Hz, 1H), 3.95 (t, J = 6.7 Hz, 1H), 3.59 (dd, J = 11.2, 4.1 Hz, 1H), 3.43 (dd, J = 11.2, 6.9 Hz, 1H), 2.80 (q, J = 6.8 Hz, 2H), 2.71 (q, J = 6.0 Hz, 1H), 2.45 (m, 2H), 2.40 (s, 3H). 13C NMR (methanol-d4, 100 MHz, 25°C): δ 152.39, 152.09, 146.59, 142.86, 133.97, 131.66, 130.80, 130.43, 123.77, 123.73, 74.42, 63.66, 57.95, 36.28, 35.05, 21.45. IR (neat, ATR): 3345, 3286, 3024, 2922, 2855, 1601, 1581, 1497, 1451, 1416, 1302, 1154, 1050, 1034, 1012, 965, 849, 827, 712, 643, 617, 558. HRMS (ESI+): m/z calcd. for [C20H26N3O2]+: 340.2020, found: 340.2022 ([M + H]+). Melting point: 141°C. aSph-2 (15.0 mg, 0.0442 mmol, 1.0 equiv.) and pentadec-14-ynoic acid (10.5 mg, 0.0442 mmol, 1.0 equiv.) were dissolved in CH2Cl2 (1.5 mL) and the solution was cooled to 0°C with an ice bath. Diisopropylethylamine (23.1 µL, 0.133 mmol, 3.0 equiv. ), 1-ethyl-3-(3-dimethylaminopropyl)carbodiimide hydrochloride (12.7 mg, 0.0663 mmol, 1.5 equiv.) and 1-hydroxybenzotriazole hydrate (11.5 mg, 0.0751 mmol, 1.7 equiv.) were added sequentially to the flask, and the mixture was allowed to warm to room temperature and was stirred for 4 hr. TLC analysis indicated some aSph-2 remained, and the mixture was cooled to 0°C and additional pentadec-14-ynoic acid (5.2 mg, 0.022 mmol, 0.5 equiv. ), diisopropylethylamine (7.7 µL, 0.044 mmol, 1.0 equiv. ), 1-ethyl-3-(3-dimethylaminopropyl)carbodiimidehydrochloride (4.2 mg, 0.022 mmol, 0.5 equiv.) and 1-hydroxybenzotriazole hydrate (3.4 mg, 0.22 mmol, 0.5 equiv.) were added. The mixture was left to stir at room temperature for 17 hr and saturated aqueous sodium bicarbonate solution (5 mL) was added. The aqueous layer was separated and extracted with CH2Cl2 (3 × 5 mL). The combined organic layers were washed with 1 M hydrochloric acid (5 mL) and brine (5 mL), dried over anhydrous sodium sulfate, filtered and concentrated under reduced pressure. The residue was purified by flash column chromatography (80% EtOAc in pentane) to afford caCer-4 (17.2 mg, 0.0307 mmol, 70%) as an orange solid. TLC (80% EtOAc in pentane): Rf=0.30. 1H NMR (CDCl3, 400 MHz, 25°C): δ 7.82 (d, J = 8.4 Hz, 2H), 7.80 (d, J = 8.4 Hz, 2H), 7.31 (d, J = 8.4 Hz, 2H), 7.29 (d, J = 8.4 Hz, 2H), 6.20 (d, J = 7.6 Hz, 1H), 5.79 (dt, J = 14.0, 6.5 Hz, 1H), 5.52 (dd, J = 14.0, 6.2 Hz, 1H), 4.28 (t, J = 5.0 Hz, 1H), 3.85 (dq, J = 7.5, 3.7 Hz, 1H), 3.79 (dd, J = 11.3, 3.9 Hz, 1H), 3.61 (dd, J = 11.3, 3.5 Hz, 1H), 2.79 (t, J = 7.5 Hz, 2H), 2.46 (m, 2H), 2.43 (s, 3H), 2.18 (m, 4H), 1.94 (t, J = 2.6 Hz, 1H), 1.61 (t, J = 7.3 Hz, 2H), 1.50 (q, J = 7.3 Hz, 2H), 1.43–1.33 (m, 2H), 1.30–1.22 (m, 16H). 13C NMR (CDCl3, 100 MHz, 25°C): δ 174.14, 151.32, 150.86, 144.70, 141.56, 132.33, 130.28, 129.86, 129.30, 122.90, 122.89, 84.97, 74.45, 68.19, 62.41, 54.56, 36.92, 35.35, 33.83, 29.73, 29.71, 29.63, 29.51, 29.42, 29.25, 28.90, 28.62, 25.88, 21.65, 18.53. IR (neat, ATR): 3294, 2920, 2850, 1643, 1603, 1542, 1467, 1377, 1279, 1156, 1104, 1049, 1014, 960, 895, 840, 722. HRMS (ESI+): m/z calcd. for [C35H50N3O3]+: 560.3847, found: 560.3851 ([M + H]+). Melting point: 111°C. Chemistry and Physics of Lipids 197:45–59. Berichte Der Deutschen Chemischen Gesellschaft 7:1638–1640. Journal of the American Chemical Society 138:12981–12986. Journal of Lipid Research 54:2282–2290. Nature Reviews. Molecular Cell Biology 1910:175–191. Biochimica Et Biophysica Acta (BBA) - Molecular and Cell Biology of Lipids 1841:1085–1096. Chemistry and Physics of Lipids 194:117–124. Journal of Lipid Research 58:962–973. Biochimica Et Biophysica Acta (BBA) - Lipids and Lipid Metabolism 1082:113–125. Molecular and Cellular Biology 31:4205–4218. Synlett : Accounts and Rapid Communications in Synthetic Organic Chemistry 19:2799–2802. The Journal of Organic Chemistry 77:1101–1112. J. Chem. Soc., Trans. 67:925–933. Journal of Biological Chemistry 286:28544–28555. The Journal of Organic Chemistry 63:7999–8003. The Journal of Organic Chemistry 66:4766–4770. Journal of Biological Chemistry 291:23978–23988. The Journal of Organic Chemistry 72:1842–1845. The Journal of Organic Chemistry 70:2350–2352. Progress in Lipid Research 52:424–437. The Journal of Organic Chemistry 79:1719–1728. Journal of Biological Chemistry 282:17537–17547. Progress in Lipid Research 63:93–119. Journal of Biological Chemistry 279:18688–18693. Seikagaku: The Journal of Japanese Biochemical Society 72:1420–1425. Thank you for submitting your work entitled "Optical manipulation of sphingolipid biosynthesis using photoswitchable ceramides" for consideration by eLife. Your article has been reviewed by three peer reviewers, and the evaluation has been overseen by a Reviewing Editor and a Senior Editor. The following individuals involved in review of your submission have agreed to reveal their identity: Anant K Menon (Reviewer #3). Tools that can modulate levels of lipids in cells are valuable resources for understanding membrane biology and all three reviewers agreed that the photo-switchable ceramides reported in this work were potentially interesting in this regard. However, the manuscript does not provide a clear vision of the applicability of this tool and it was unclear to the reviewers how these artificial ceramides could provide insights into sphingomyelin biology or other membrane signaling processes. The reviewers had several other concerns and suggestions for improvements (see comments below) and would be interested in reviewing a revised version of the manuscript at a later time point, but only if all their points were fully addressed. In this paper, Frank et al. describe a clever method to modulate the sphingomyelin concentrations of cells. This paper is submitted as a candidate for the "Tools" category of papers for eLife. Unlike cholesterol, which can be rapidly depleted by cyclodextrins and rapidly repleted by lipoprotein particles or cholesterol/cyclodextrin complexes, there is no robust way to modulate levels of other lipids. As such, I was excited by the promise of this paper to "optically manipulate sphingolipid biosynthesis". The authors claim light-induced induction of domains in membranes (lakes) which can be reversed. However, this reversibility (Figure 3) is not convincing. The claim of light-induced increase in SM synthesis is correct, but this is not technically reversible. The sphingomyelin that has been made (with the extra benzenes) is still there, even when the optical manipulation is reversed. A "pulse" of SM synthesis may be more accurate. It would be useful to compare the rise in SM levels with the method described here to other methods such as delivery of BSA/sphingomyelin conjugates or delivery of sphingomyelin liposomes (Bierman/Slotte). A more detailed description of what could be done with this method (in the Discussion) would be helpful to evaluate the utility of this clever method. Frank et al. have recently published papers on photoswitchable azobenzene-lipids, specifically on diacylglycerols and ceramides. 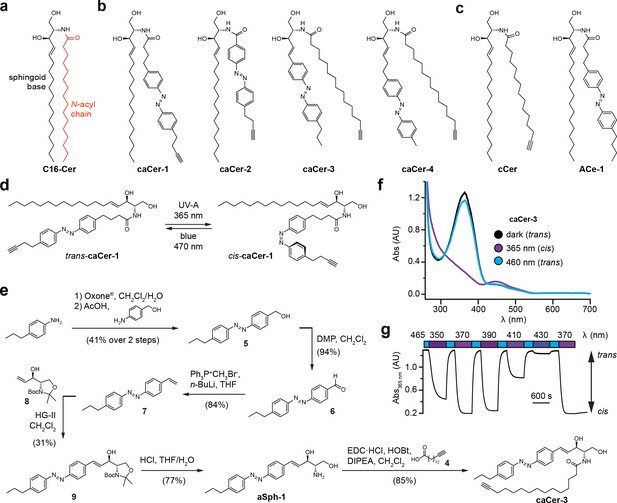 They have convincingly demonstrated photoswitching of DAG-activated signalling as well as switching structural parameters of a reconstituted lipid bilayer by a switchable ceramide. In the present manuscript, they extend the previous work on ceramides by addition of a triple bond that can be used for metabolic tracing and explore the usability of the resulting ceramide as a switchable substrate for a major metabolic pathway of ceramides, i.e. conversion by SMS2 to sphingomyelin (SM). As a proof-of-principle study, the present manuscript indeed shows that photoswitching of ceramide as a SMS2-substrate is possible. Since the manuscript is submitted as a toolbox paper, it should yet also be useful for more widespread applications. At this point I do have major concerns. On the one hand, the new ceramides can be used to photoswitch phase behavior in reconstituted systems, but comparison of the data in Figure 3 with those found in the 2016 paper by the same authors indicate that the simpler ceramides in that study perform much better for this task. On the other hand, some aspects of metabolic conversion of the new ceramides raise questions about the usefulness of the compounds for this purpose. While SMS2 does not discriminate cis- and trans-states for some of the compounds, for some others, most noticeable caCer-1, it is the cis-state that is accepted by the enzyme, but not the trans-state. Natural SM has a fatty acid distribution dominated by 16:0, 18:0 (brain), 20:0, 22:0, 22:1, 24:1 and 24:2. Higher unsaturated species do not appear in relevant amounts. Given that, a substrate with a bulky, irregular shape resembling a polyunsaturated fatty acid (as also demonstrated by the authors in their beautiful DAG study) is hardly representing a biologically relevant species. The fact that the trans-conformation, which in principle should be preferred by the enzyme, is not converted to product raises even more concerns. In vivo (cell culture), the substances are not well metabolized, leaving the ceramides as major species after 1h of incubation. This is in line with previous observations indicating that long-chain ceramides are difficult to deliver to cells and slow in subsequent metabolism. It is unclear which biological properties the produced SM with the very unnatural ceramide backbone would have, and it is, at least to me, also unclear where the application for that would be. More generally, I see the obvious use for switching DAG as a signalling substance, but I cannot see where the application for switching a very artificial ceramide as a substrate for SMS2 really is. If the purpose is just providing or not a metabolic substrate, this can be done (and is regularly being done) by simply applying and withdrawing natural or other labeled precursor lipid to the growth medium in a pulse-chase experiment. In essence, this is a study with an original idea that is technically well done (with the limitations discussed for Figure 3) but with a very narrow focus lacking broader applicability. The photoswitchable ceramides described in this report are interesting and potentially useful tools, although their precise application is only hinted at by the authors rather than explicitly discussed or demonstrated. The reversibility of the so-called 'lakes' is qualitative at best and it seems that this could depend on the specific image presented – this phenomenon should be scored/quantified somehow. The Ld/Lo ratio hardly changes during the light regime – how do the authors interpret this? Perhaps a better explanation is necessary or the phenomenon is simply not robust. SM synthesis rates (Figure 5): there are different rates of synthesis in under blue light depending on the light regime used – sometimes finite (~0.2 units per 10 min), sometimes zero. Why would this be the case? Is the reagent limiting? The authors invoke the temporal precision of light activation. Can spatial precision also be useful in this system? The comment that the light-induced effects are reversible is not true in a practical sense. Although the ability of the ceramide reagents to be used as substrates for SM synthase can be controlled by light, the products formed are permanent for the time of the experiment. Thus control of conditions is not as precise as, for example, in the case of photoswitchable ligands for GPCRs where the same cis-trans isomerization trick can be used to bring a ligand within reach of a binding pocket and then pull it away by changing illumination. Thank you for resubmitting your work entitled "Optical manipulation of sphingolipid biosynthesis using photo switchable ceramides" for further consideration at eLife. Your revised article has been favorably evaluated by three reviewers, and the evaluation has been overseen by a Reviewing Editor and Michael Marletta as the Senior Editor. The manuscript has been improved but, as outlined below, there are some remaining issues that need to be addressed before a final decision can be reached. 1) It is impossible to infer co-localization from Figure 5B alone. Please quantify the extent of overlap between SMS2-V5 and GM130 using appropriate image analysis tools. 2) Irradiation with UV light for 30 sec, as stated in the Materials and methods section might affect the HeLa cells in many ways. As stated in subsection “Optical manipulation of SM biosynthesis in living cells”, 'Cells that did not receive any light treatment and that were kept in the dark throughout the incubation period served as control. ', is not sufficient. Cells equally exposed to light but without added probe should serve as an additional control. 3) What is the meaning of a.u. in the SM production from yeast cells in Figure 4? Using standards and a protein determination, the amount of synthesized SM could be provided and normalized to mg of protein. The current presentation is unconventional. 4) Besides studying metabolism, another goal of using dye-clickable lipid probes should be to visualize the tagged lipids in living cells. Has this been attempted? If so, please show or discuss the results, as in case of useful results, this would tremendously increase the usability of the described ceramide analogs. As another discussion point, please address whether possible changes in intracellular localization due to photo-activation could also play a role in the context of the substrate specificity of the synthetases, as one isomer might by shielded compared to the other. 5) The relevance of Lo/Ld partitioning observed in model membranes to membranes of living cells is still under debate. Which cellular membranes do the authors have in mind in which Lo/Ld-coexistence has been shown under physiological conditions? The third paragraph of the Discussion which ends with 'Conceivably, isomerization of this compound to trans may lead to a less pronounced clustering in cellular membranes.' should be removed or re-expressed. However, after reading the paper, it is unclear to me whether this method delivers on this promise and even if it did, what could be learned using this method. The authors describe photoswitchable ceramides that can be added to cells and then subsequently converted by plasma membrane SMase2 into sphingomyelin after optical activation with a particular wavelength. The work follows up on their 2016 paper in JACS where they initially describe this concept. We acknowledge that the reversibility of light-induced effects on lipid domains in supported lipid bilayers (SLBs) may not have been entirely obvious from the original figure. In our previous study on azobenzene-containing ceramides (ACes; Frank et al., 2016), we observed more pronounced light-induced effects on lipid domains in SLBs containing 19 mol% azolipid than in SLBs containing 11 mol% azolipid. For the original experiments in our current study, SLBs with 11 mol% azolipid were used. Therefore, we have now revised the original figure (formerly Figure 3, now Figure 2) and included new confocal images and high-speed AFM analysis of SLBs containing 19 mol% caCer-3 or caCer-4, in which the reversibility of light-induced effects on lipid domains is more evident. Note that photoisomerisation primarily affects the ratio between Lo and Ld areas. On isomeration of dark-adapted caCers to cis by UV-A light, Ld lakes form within the Lo phase (Figure 2B). During equilibration, these lakes laterally diffuse toward the Ld phase or coalesce into larger lakes in an effort to minimize line tension. On isomerization of caCers to trans by blue light, the Ld lakes shrink while the surrounding Lo area grows “fatter”, essentially occupying the same total area as in the original dark-adapted state. These results are in line with our previous work and can also be appreciated in the new Videos 1 and 2. To demonstrate that the light-induced effects on lipid domains are reversible over multiple cycles, we have also plotted the normalized Lo area in both caCer-3 and caCer-4 containing SLBs over time (Figure 2C). These novel data are now described in detail in subsection “caCers enable optical control of ordered lipid domains in supported bilayers”. The reviewer correctly points out that SM formed from photoswitchable ceramides is essentially permanent, at least within the timespan of the experiment. However, as caCer-1 and caCer-3 serve as light-sensitive substrates, they enable reversible control over the rate of SM production. As demonstrated in Figure 4 (formerly Figure 5) and now explicitly stated in subsection “Optical manipulation of SM biosynthesis in living cells”, this allowed us to generate time-resolved pulses of SM synthesis by light. Moreover, we included new data demonstrating that caCers can also be used to generate pulses in the production of glucosylceramide, the precursor of complex glycosphingolipids (new Figure 6). We have now amended the Abstract, Results and Discussion sections to avoid potential confusion on the utility of caCers as light-sensitive substrates. We thank the reviewer for this remark. It is reasonable to assume that delivery of SM via BSA conjugates or liposomes would result in higher SM levels than what can be achieved with our current method. This is because our approach relies on the delivery of long-chain ceramide analogues, which are considerably more hydrophobic than SM. However, we would like to point out that our method enables superior spatiotemporal resolution for manipulating SM levels and could be used to generate controlled “pulses” of SM in subpopulations of cells in a culture dish, something that is impossible to achieve through addition of SM via BSA conjugates. To circumvent limitations associated with the delivery of hydrophobic compounds and expand opportunities for manipulating the metabolic fate and biological activity of sphingolipids by light, we set out to develop azobenzene-containing sphingosines (caSphs) as a next generation of photoswitchable sphingolipid precursors. We anticipate that these novel compounds will be more readily taken up by cells. As outlined below, we obtained first proof for the suitability of caSphs as light-sensitive substrates to exert optical control over ceramide biosynthesis. These various aspects, which are directly relevant to the general utility of our approach, are now covered in the Discussion (paragraph five). (A) Chemical structures of the clickable and azobenzene-containing sphingosines, clickSph and caSph-1. (B) UV-A-irradiated or dark-adapted clickSph and caSph-1 were incubated with lysates of yeast cells lacking ceramide synthases (-) or expressing human ceramide synthase CerS5 (+). Metabolic conversion to ceramide was monitored by TLC analysis of lipid extracts click-reacted with Alexa-647-azide. Note that metabolic conversion of caSph-1, unlike that of clickSph, is light sensitive. This point is well taken. We have now included a new figure (Figure 7) and extended the Discussion to highlight a central concept that was somewhat underexposed in the original manuscript, namely that light-induced changes in lateral packing enable instant and reversible control over both metabolic fate and signaling activity of caCers. As described in paragraph three of the Discussion, a distinct advantage of caCers over caged ceramide analogs is that their ‘bioactivity’ can be switched off by light. This enabled us to generate time-resolved pulses of SM synthesis at the plasma membrane of living cells. Our method offers superior spatiotemporal resolution for manipulating SM levels and could be used to generate controlled SM pulses in subpopulations of cells in a culture dish by patterned illumination, something that is impossible to achieve through traditional pulse-chase approaches. A particularly attractive prospect is to use cis-trans isomerization to bring caCers within reach of the binding pocket of a ceramide signaling protein, or to pull them away, thus enabling dynamic control over ceramide-operated signaling pathways (Figure 7). In fact, light-induced changes in lateral packing may be a previously unnoted characteristic of other azobenzene-containing signaling lipids like diacylglycerols, where the cis-isomers correspond to the bioactive form. We therefore anticipate that caCers will find use in dissecting the causal roles of ceramides in apoptosis, as tumor suppressors, and as antagonists of insulin signaling. As described in paragraph five of the Discussion, we now also refer to the development of photoswitchable sphingoid bases to bypass limitations associated with the poor aqueous solubility of caCers and expand opportunities for manipulating the metabolic fate and signaling activity of sphingolipids by light. Since the manuscript is submitted as a toolbox paper, it should yet also be useful for more widespread applications. At this point I do have major concerns. On the one hand, the new ceramides can be used to photoswitch phase behavior in reconstituted systems, but comparison of the data in Figure 3 with those found in the 2016 paper by the same authors indicate that the simpler ceramides in that study perform much better for this task. We thank the reviewer for this remark, which has now been addressed as outlined in our response to comment #1 of reviewer #1. In brief, we included new data demonstrating that the light-induced effects on lipid domains in model bilayers containing caCer-3 or caCer-4 are reversible over multiple cycles (new Figure 2C), very similar to what we reported in Frank et al., 2016, for model bilayers containing the simpler ceramides. On the other hand, some aspects of metabolic conversion of the new ceramides raise questions about the usefulness of the compounds for this purpose. While SMS2 does not discriminate cis- and trans-states for some of the compounds, for some others, most noticeable caCer-1, it is the cis-state that is accepted by the enzyme, but not the trans-state. Natural SM has a fatty acid distribution dominated by 16:0, 18:0 (brain), 20:0, 22:0, 22:1, 24:1 and 24:2. Higher unsaturated species do not appear in relevant amounts. Given that, a substrate with a bulky, irregular shape resembling a polyunsaturated fatty acid (as also demonstrated by the authors in their beautiful DAG study) is hardly representing a biologically relevant species. The fact that the trans-conformation, which in principle should be preferred by the enzyme, is not converted to product raises even more concerns. It is indeed remarkable that the cis-isoforms of caCers (notably caCer-1 and caCer-3) are better substrates for SMS2 than the trans-isoforms, as the latter resemble native ceramides more closely. We have now included new data showing that glucosylceramide synthase, a sphingolipid biosynthetic enzyme structurally unrelated to SMS2, also preferentially accepts the cis-isoforms as substrates for the production of glucosylceramide (GlcCer; new Figure 6). Although highly saturated ceramides are the most common ceramide species in cells, most literature indicates that SM and GlcCer synthases are relatively tolerant towards structural deviations in the ceramide backbone (Koval and Pagano, 1991; Huitema et al., 2004; Haberkant et al., 2016). Combined with the atomic force microscopy data (new Figure 2), these results support the idea that the marked differences in metabolic conversion between trans- and cis-isoforms of caCers are due to light-induced alterations in their lateral packing. Thus, we postulate that blue light triggers self-assembly of caCers into tightly packed clusters driven by intermolecular stacking of the flat trans-azobenzene groups, thereby reducing their availability for metabolic conversion by SM and GlcCer synthases. In contrast, UV-A irradiation causes caCers to disperse in the membrane as the bent cis-azobenzene groups disrupt intermolecular stacking, making them more accessible for metabolic conversion. As illustrated by the model in new Figure 7B, these light-induced changes in lateral packing would enable instant and reversible control over metabolic fate and signaling activity of caCers and other azobenzene-containing lipids. Indeed, our previous work on photoswitchable DAGs revealed that the cis-isomer of these compounds correspond to the bioactive form that promotes translocation of protein kinase C toward the plasma membrane (Frank et al., 2016). Moreover, the model is supported by biophysical studies demonstrating that the trans-isomers of photoswitchable phosphatidylcholines are more tightly packed in the membrane than the cis-isomers (Pernpeintner et al., 2017, Langmuir 33, 4083), and helps explain our recent finding that the cis-isoform of a photoswitchable sphingosine is the preferred substrate for ceramide biosynthesis (see our response to comment #3 of reviewer #1). These considerations, which are directly relevant to the general utility of our approach, are now covered in the Discussion (paragraph two to four). In vivo (cell culture), the substances are not well metabolized, leaving the ceramides as major species after 1h of incubation. This is in line with previous observations indicating that long-chain ceramides are difficult to deliver to cells and slow in subsequent metabolism. This is a valid point. To circumvent limitations associated with the relatively inefficient uptake of caCers by cells and to expand opportunities for manipulating the metabolic fate and biological activity of sphingolipids by light, we set out to develop clickable, azobenzene-containing sphingosines (caSphs) as novel photoswitchable sphingolipid precursors. As outlined in our response to comment #3 of reviewer #1, we obtained first experimental proof for the suitability of caSphs as light-sensitive substrates to exert optical control over ceramide biosynthesis. This issue, which is also directly relevant to the general utility of our approach, is now covered in the Discussion (paragraph five). It is unclear which biological properties the produced SM with the very unnatural ceramide backbone would have, and it is, at least to me, also unclear where the application for that would be. More generally, I see the obvious use for switching DAG as a signalling substance, but I cannot see where the application for switching a very artificial ceramide as a substrate for SMS2 really is. If the purpose is just providing or not a metabolic substrate, this can be done (and is regularly being done) by simply applying and withdrawing natural or other labeled precursor lipid to the growth medium in a pulse-chase experiment. We acknowledge that the general applicability of our method was underexposed in the original manuscript. As outlined in our response to comment #4 or reviewer #1, we have now included a new figure (Figure 7) and extended the Discussion to provide a more detailed description of what could be done with our method and highlight its utility. We acknowledge that this point was underexposed in the original version of the manuscript. To highlight the broader applicability of caCers and other photoswitchable lipids, we revised the Discussion and also included a new figure (Figure 7). Details of these revisions are outlined in our responses to comment #4 of reviewer #1 and comment #2 of reviewer #2. We thank the reviewer for this remark, which has now been addressed as outlined in our response to comment #1 of reviewer #1. In brief, we have included new data demonstrating that the light-induced effects on lipid domains in model bilayers containing caCer-3 or caCer-4 (changes in Lo/Ld ratio) are reversible over multiple cycles (new Figure 2C). The reviewer rightly notes that there is some variability in the rate of conversion in the blue regime, depending on whether conversion is measured in an early or later time interval. As a first measure to prevent the enzyme reaction from reaching saturation, we chose the shortest time regime that was still compatible with sample manipulation as detailed in the Materials and methods section. Judged from the cCer measurements, the enzyme reaction is indeed linear over 0-30 min. However, for the caCers there is a trend to lower conversion rates with increasing time, indicative of a slight saturation of the enzyme reaction. Under all conditions, the amount of SM formed was only a few percent of the total amount of available ceramide substrate. Click reactions were performed with Alexa-azide in molar excess over total alkynes. Therefore, these reagents unlikely become limiting during the experiment. The rate of SM production also relies on the availability of the phosphocholine head group donor PC. While PC is generally considered an abundant membrane component, yeast harbors Golgi- and PM-resident flippases that translocate PC from the exoplasmic to the cytosolic leaflet (Alder-Baerens et al., 2006, Mol Biol Cell 17, 1632). It is conceivable that these flippases render the pool of exoplasmic PC available for SMS2-mediated SM production limiting. However, experimental validation of this possibility goes beyond the scope of our current study. In spite of a partial saturation effect, we consistently observed that for caCer-1 and caCer-3 the rates of SM synthesis under UV-A light were significantly higher than those under blue light. As now described in the Discussion, our method offers superior spatiotemporal resolution for manipulating sphingolipid levels and could be combined with patterned illumination to generate controlled sphingolipid pulses in subpopulations of cells or subcellular organelles, something that is impossible to achieve through traditional pulse-chase approaches. Moreover, cis-trans isomerization of caCers could be used alongside patterned illumination to dissect the causal roles of ceramides in apoptosis, as tumor suppressors, and as antagonists of insulin signaling (Discussion paragraph three). We acknowledge that SM formed from caCers is essentially permanent. However, as caCer-1 and caCer-3 serve as light-sensitive substrates, they enable reversible control over the rate of SM production. As demonstrated in Figure 4 (formerly Figure 5) and now explicitly stated in paragraph two of subsection “Optical manipulation of SM biosynthesis in living cells”, this allowed us to generate pulses of SM synthesis by light. Moreover, we have included new data indicating that glucosylceramide synthase, an enzyme structurally unrelated to SM synthase, also preferentially accepts cis- over trans-isomers as substrates for glucosylceramide biosynthesis (new Figure 6). As illustrated in the model in new Figure 7B, we postulate that the marked differences in metabolic conversion between trans- and cis-isoforms of caCers are due to light-induced alterations in their lateral packing. In line with the atomic force microscopy data (new Figure 2), blue light would trigger self-assembly of caCers into tightly packed clusters driven by intermolecular stacking of the flat trans-azobenzene groups, thereby reducing their availability for metabolic conversion by sphingolipid biosynthetic enzymes. UV-A irradiation, on the other hand, causes caCers to disperse in the membrane, as the bent cis-azobenzene groups would disrupt intermolecular stacking. This, in turn, would make these reagents more accessible for metabolic conversion. As indicated in Figure 7B and outlined in our response to comment #2 of reviewer #2, we believe that essentially the same physicochemical principles may apply in the case of photoswitchable ligands for GPCRs, where cis-trans isomerization can be used to bring the ligand within reach of a binding pocket or pull it away. These considerations, which are directly relevant to the general utility of our approach, are now covered in the Discussion (paragraph four). As requested, we have further developed our image analysis to better infer the partial co-localization of SMS2-V5 and the Golgi marker GM130. To this end, we pseudo-colored the α-V5 and α-GM130 channels green and magenta, respectively, alongside addition of a merge to demonstrate overlap (see updated Figure 5B). Moreover, we included intensity plots to show the level of co-localization between SMS2-V5 and GM130 in a more quantitative manner. Our fluorescence microscopy analysis indicates that SMS2-V5 is predominantly localized to the plasma membrane, and to a lesser extent to the Golgi apparatus. This is in line with the results obtained from subcellular membrane fractionation studies [Tafesse et al., 2016, J. Biol. Chem. 282, 17537-17547; Ref. 35]. We thank the reviewer for pointing out this ambiguity in our wording. In fact, the “no irradiation” condition was used as a comparison to obtain a baseline amount of SM that was formed from incubation of SMS2 overexpressing HeLa cells with trans-caCer only. To demonstrate dynamic photoswitching over the course of the experiment in living cells (now seen in Figure 5I), the amount of SM formed in the untreated cells is similar to that formed by cells that received the UV-A→blue treatment. This is expected, as this irradiation protocol generates trans-caCer-1 for the majority of the incubation. In contrast, when cells received the blue→UV-A treatment (middle bars), cis-caCer-1 is present throughout the majority of the incubation, and consequently more SM is generated under these irradiation conditions. We cannot perform the suggested control experiment, as light-treated cells lacking the probe would not possess any alkyne functionalized lipids, thus there would be no signal to readout on the TLC. In our opinion, HeLa cells incubated with the non-switchable cCer serve as a suitable control for the effects of UV-A (or blue) illumination on the cells. As described in the Materials and methods section, the relative SM/(SM+Cer) signal was normalized to the maximal fractional SM obtained within the 30 min incubation. To make this more intuitive, we changed the y-axis labeling of Figure 4A to read % of maximum instead of a.u. We furthermore note that the amount of protein in each of the samples across all time points in Figure 4A was equal, and that therefore normalization to the amount of total protein in the crude yeast lysate was already taken into account. 4) Besides studying metabolism, another goal of using dye-clickable lipid probes should be to visualize the tagged lipids in living cells. Has this been attempted? If so, please show or discuss the results, as in case of useful results, this would tremendously increase the usability of the described ceramide analogs. We agree that this is an exciting application of our tools. As a prelude to imaging experiments in living cells, we have set out to incorporate fluorophore-tagged photoswitchable ceramides in supported lipid bilayers and examine their conformation-dependent behavior using single-molecule tracking. However, given the sophisticated and time-consuming nature of these experiments and the already broad scope of the present manuscript, these studies remain out of the scope of the current revision. As another discussion point, please address whether possible changes in intracellular localization due to photo-activation could also play a role in the context of the substrate specificity of the synthetases, as one isomer might by shielded compared to the other. Please note that in the experiments on living cells (Figure 5D-I), we mainly monitor the impact of photoswitching on metabolic conversion of externally added caCers by SMS2-V5, an enzyme predominantly located at the plasma membrane. In addition, the data obtained with cell-free produced enzymes (Figures 3D-F and 6G) clearly indicate that metabolic conversion per se is affected by light treatment. Consequently, while one could imagine that intracellular transport of caCers in living cells may also be influenced by photoswitching, this scenario is largely irrelevant for the data presented in our paper. The authors acknowledge financial support from the Deutsche Forschungsgemeinschaft (SFB1032 project B09 to DT and A09 to PS, SFB944 project P14 to JCMH), the Faculty of Biology/Chemistry from the University of Osnabrück (Incentive Award to MK), and the Natural Sciences and Engineering Research Council of Canada (PGS D Scholarship to BW). We thank Dr. Oliver Thorn-Seshold for providing the pulsed LED illumination setup, Prof. Dr. Christian Ungermann for the kind gift of the anti-Vti1p antibody, and CordenPharma Switzerland (Liestal, CH) for providing materials for chemical synthesis. © 2019, Kol et al.